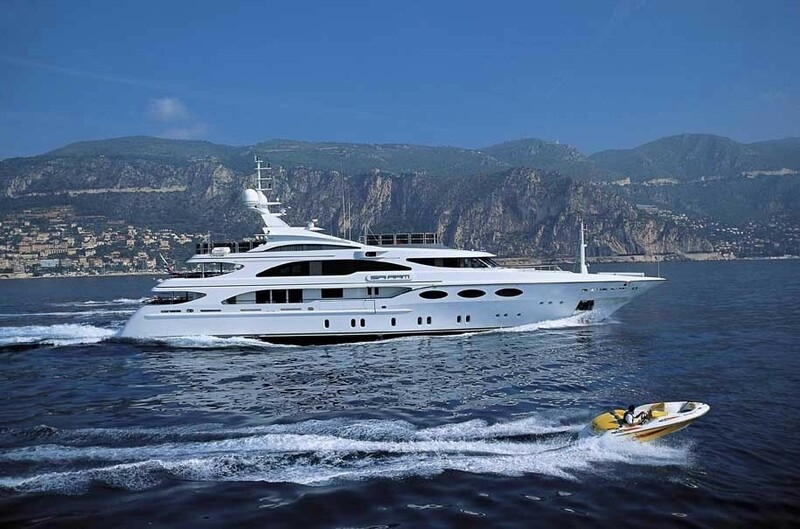 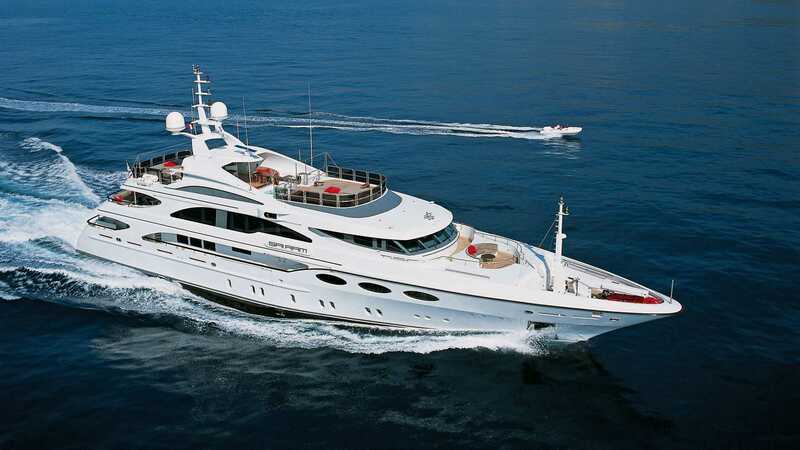 FALCON is a 51m (169' 11") luxury yacht as launched by Benetti Shipyard in 2004 and beautifully designed by Stefano Natucci. 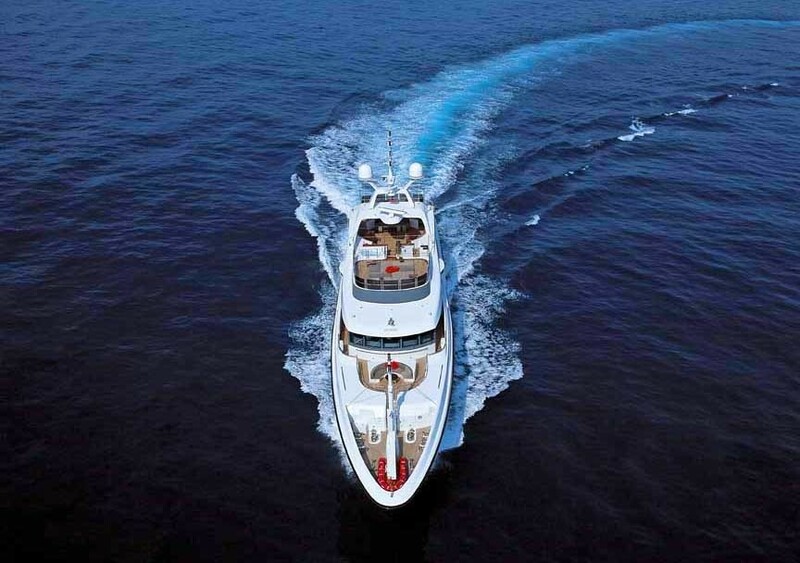 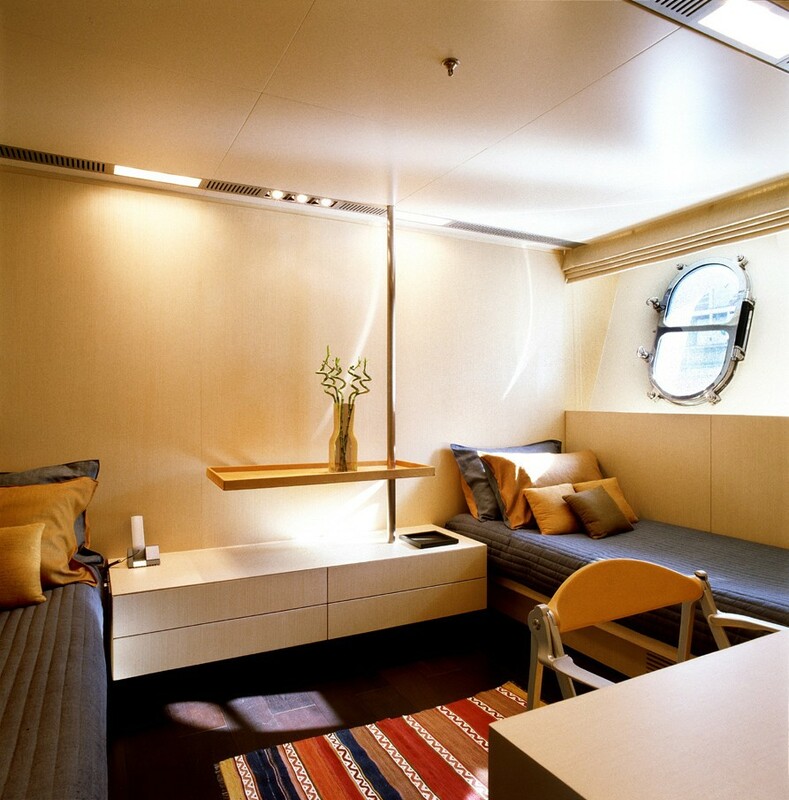 She provides a spacious, comfortable and stylish interior which has been created for family cruising. 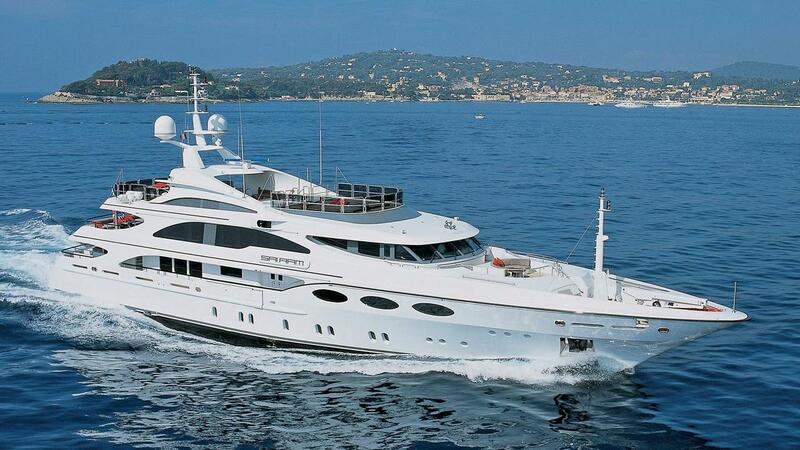 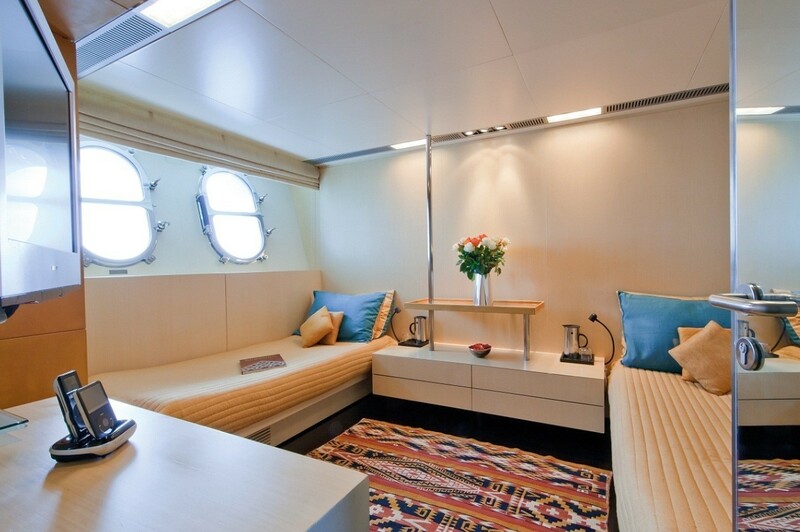 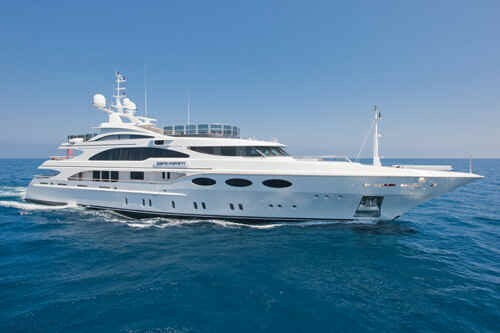 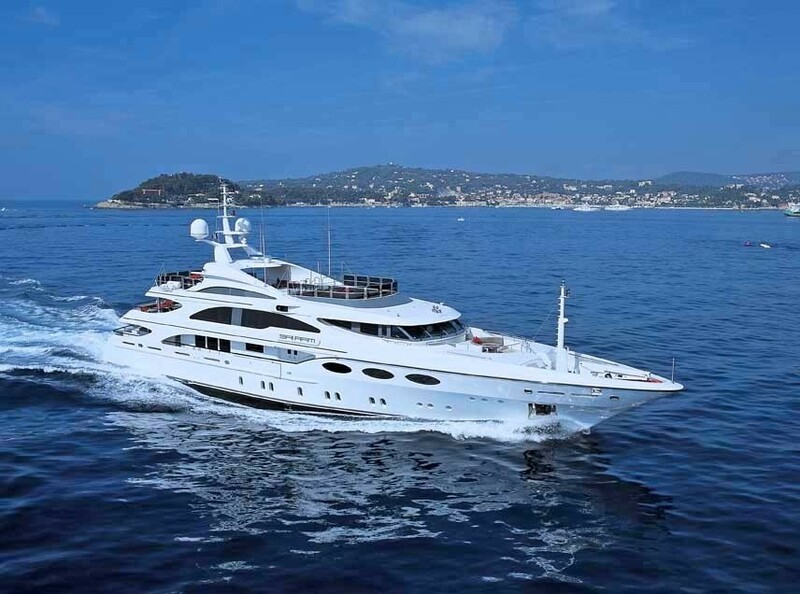 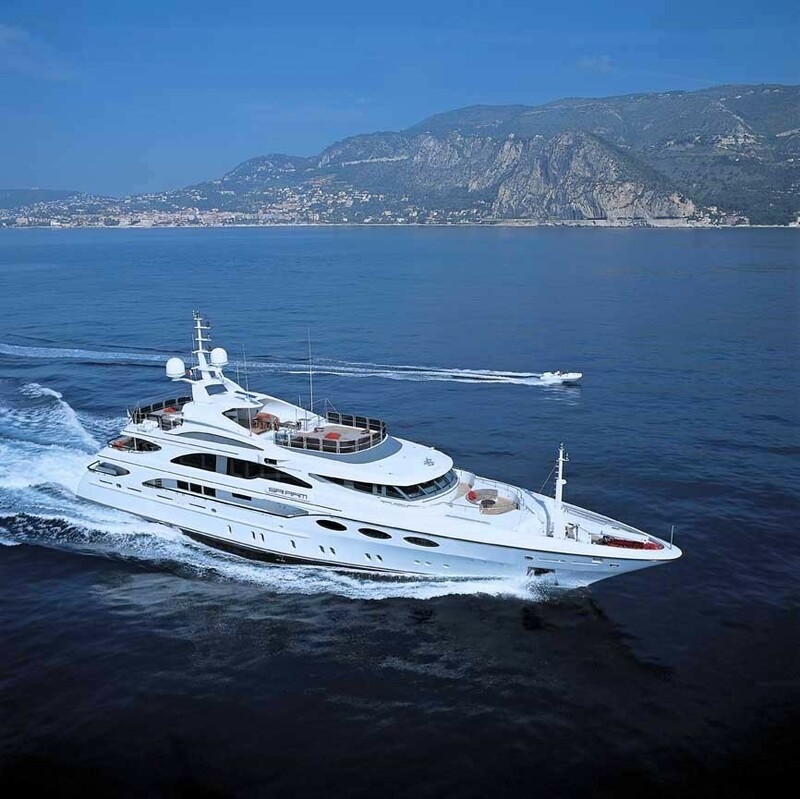 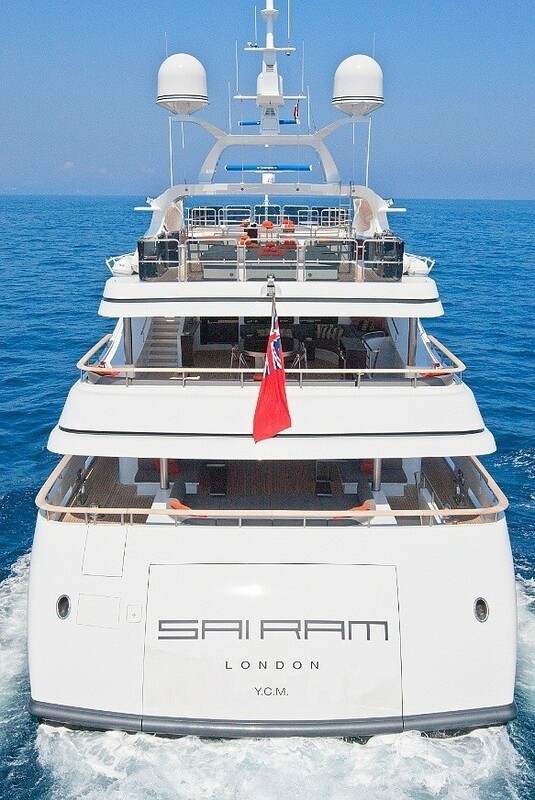 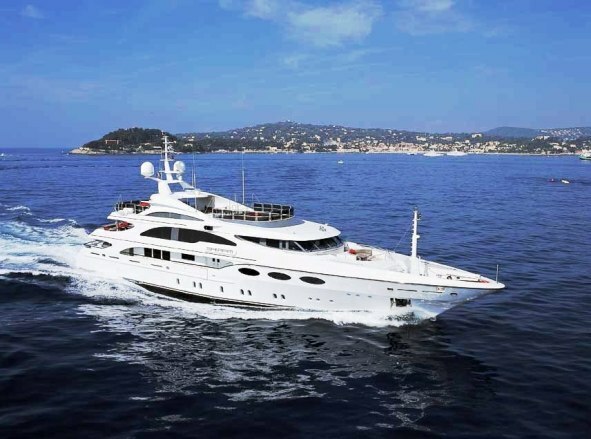 She can accommodate up to 12 guests, in 4 double cabins, and 2 twin cabins. 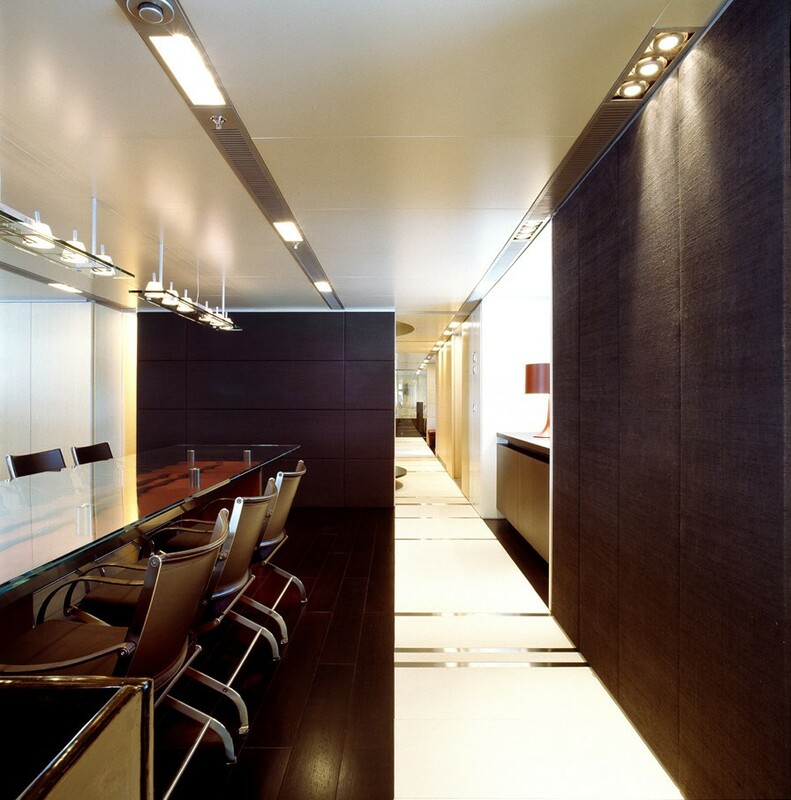 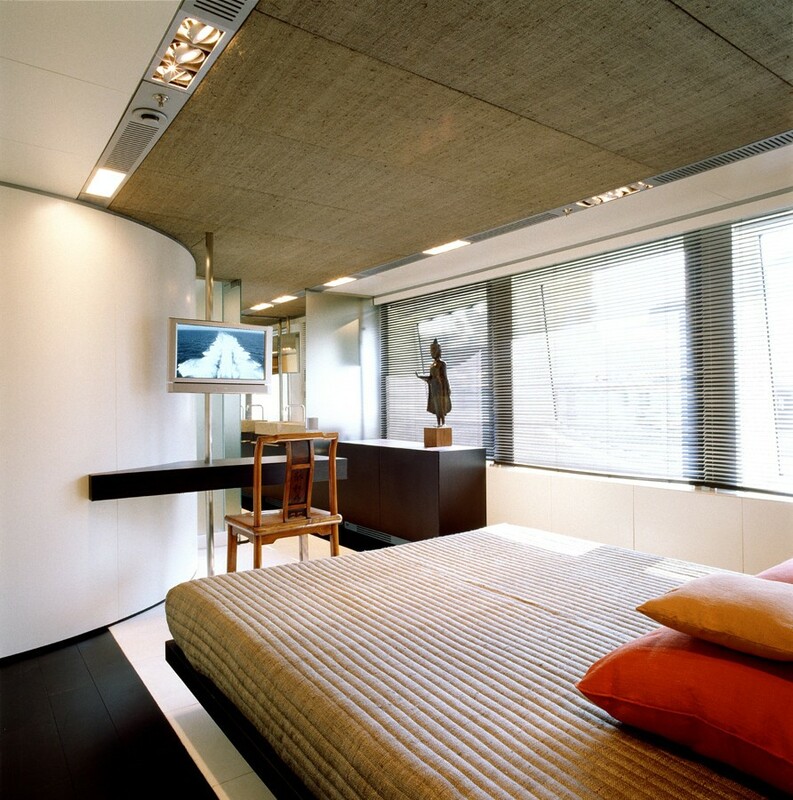 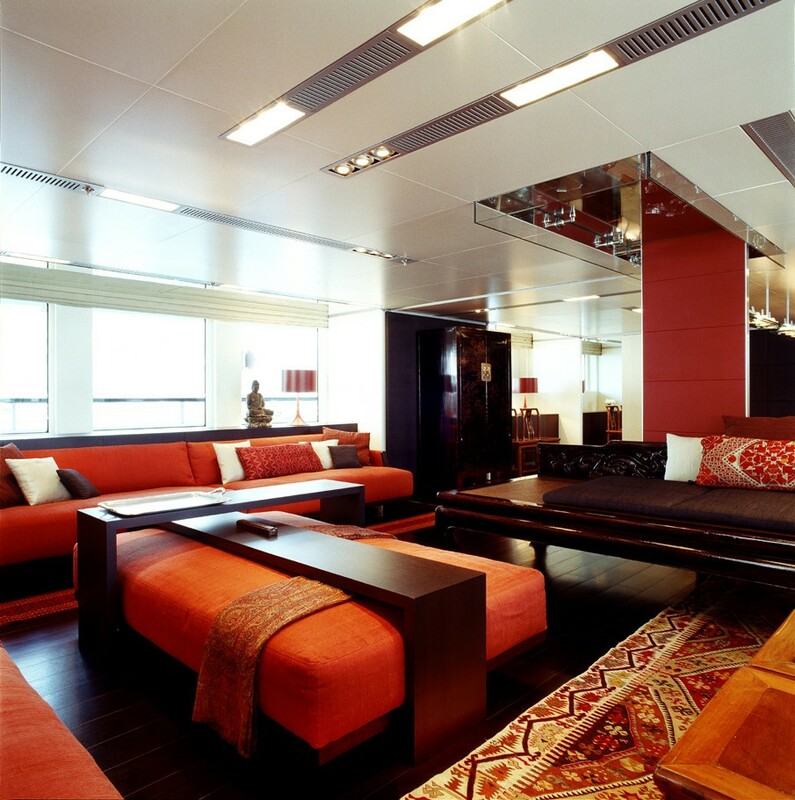 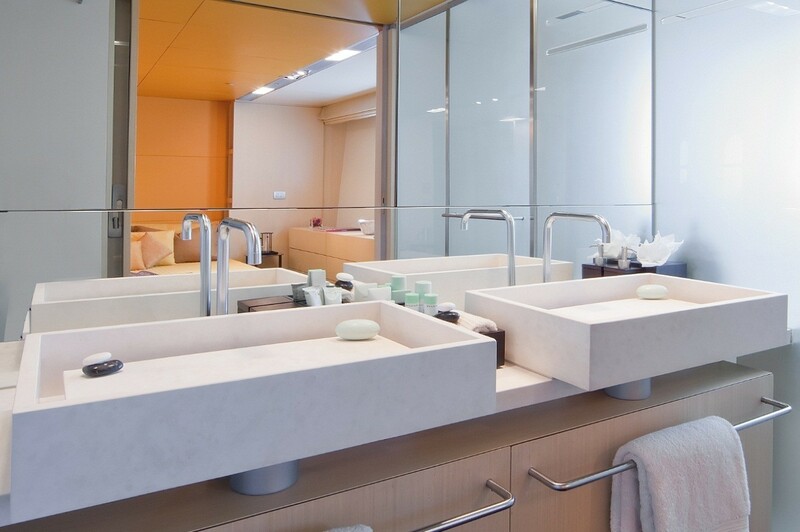 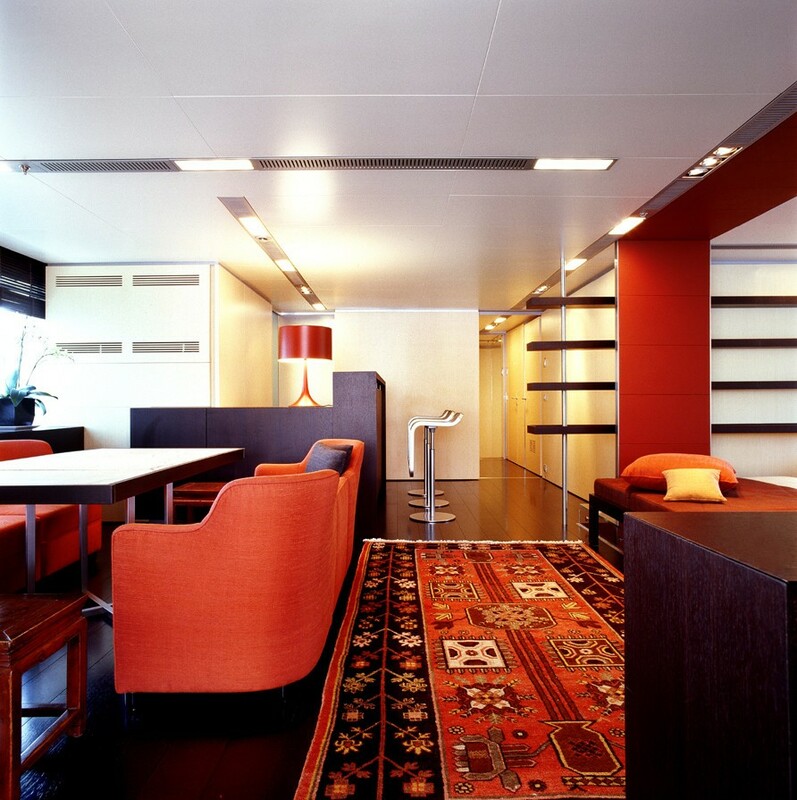 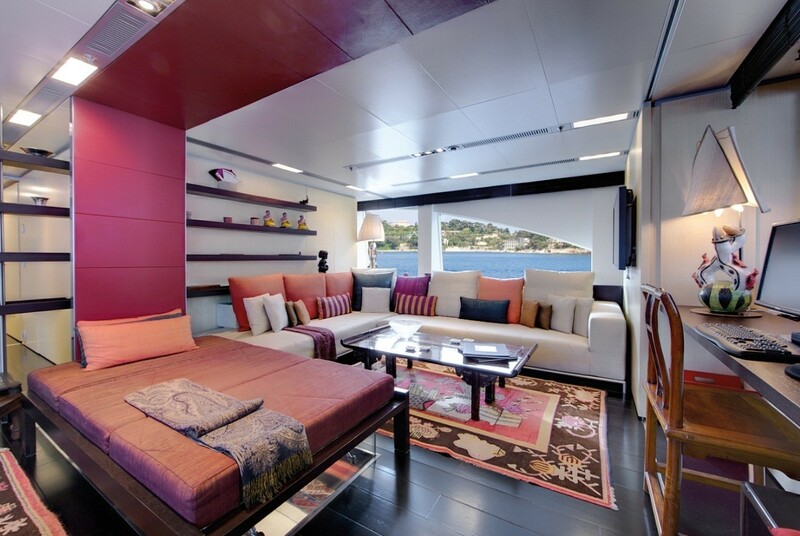 Her minimalistic zen interior design is the work of Lazzarini Pickering Architetti and can be described as modern and is highlighted by dark wood, warm colours and ample natural light throughout the yacht. 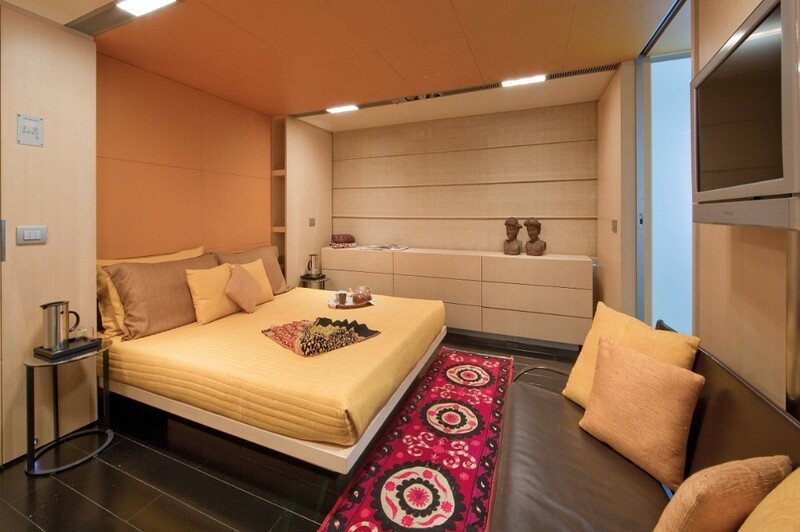 Guests will enjoy the modern design highlighted by dark wood, warm colours and lot of natural light. 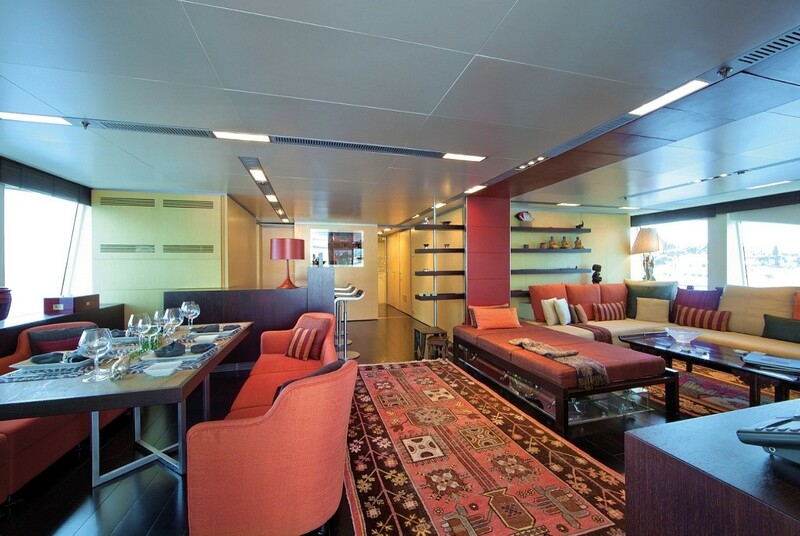 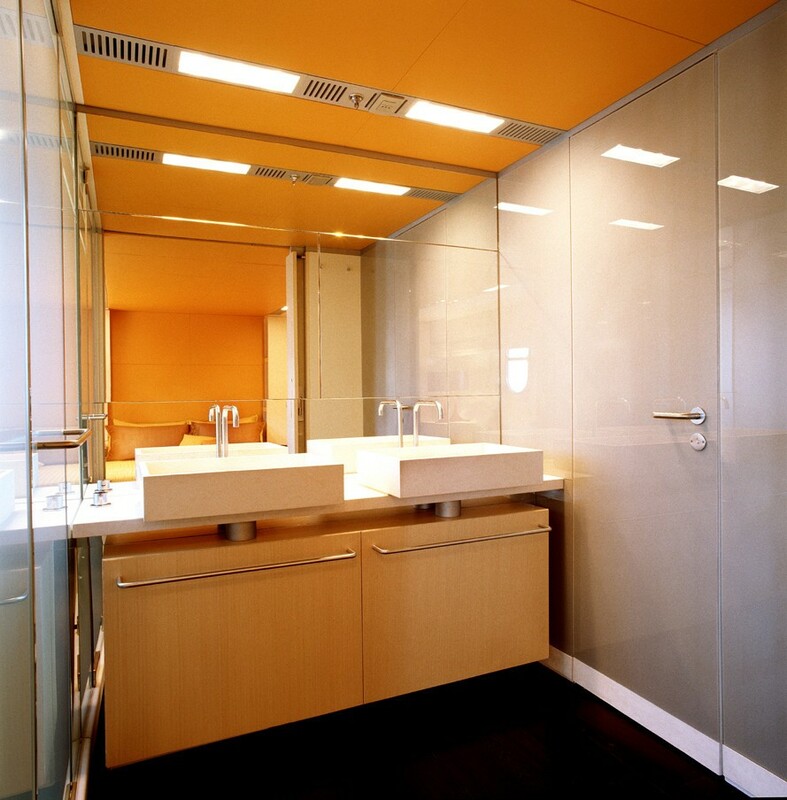 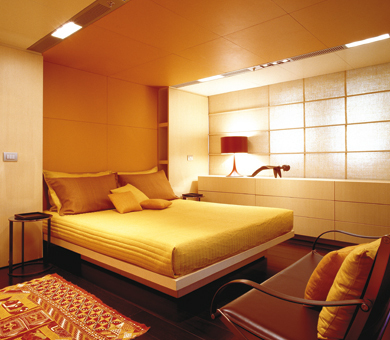 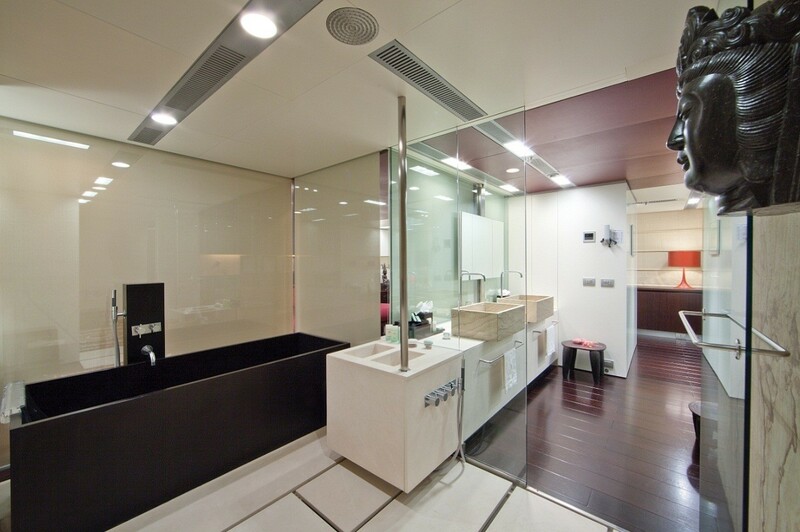 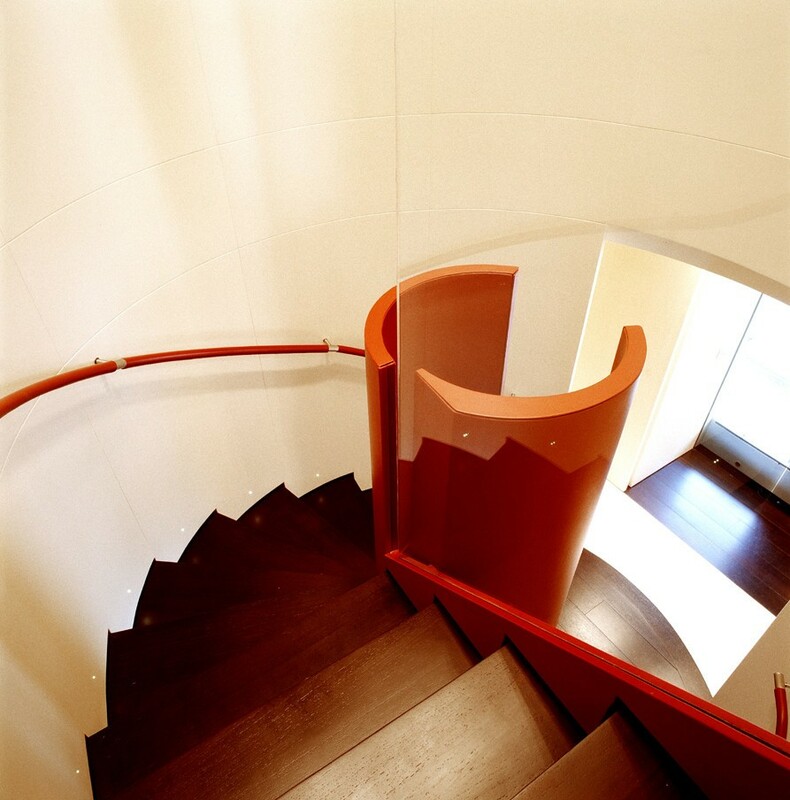 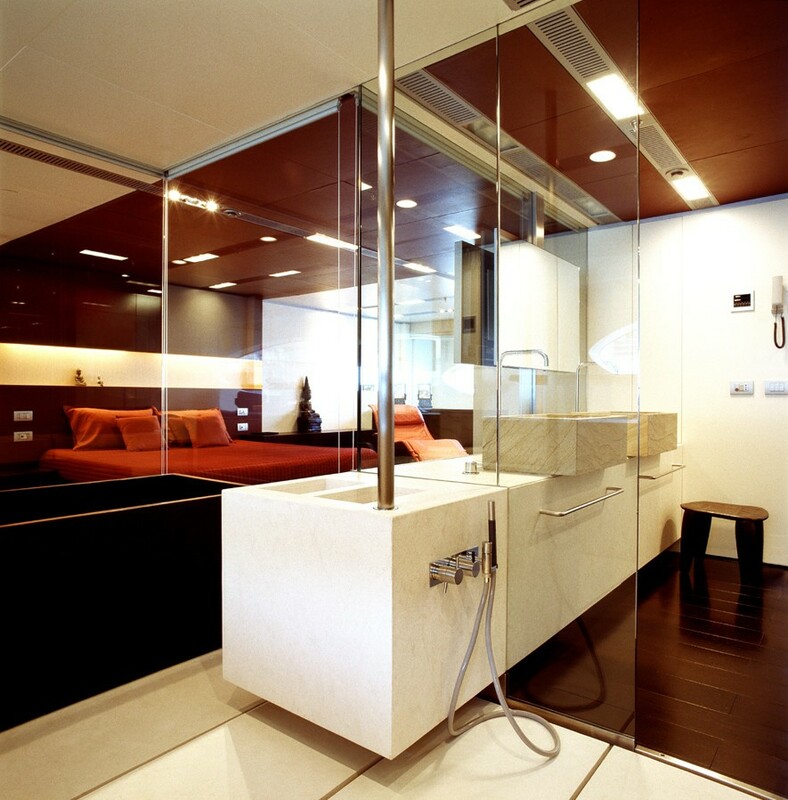 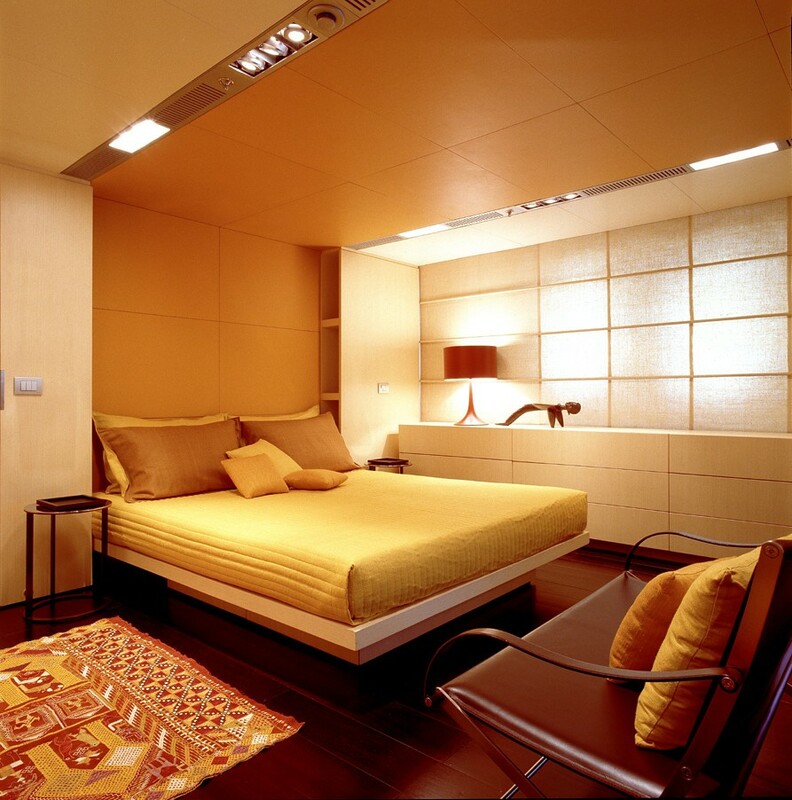 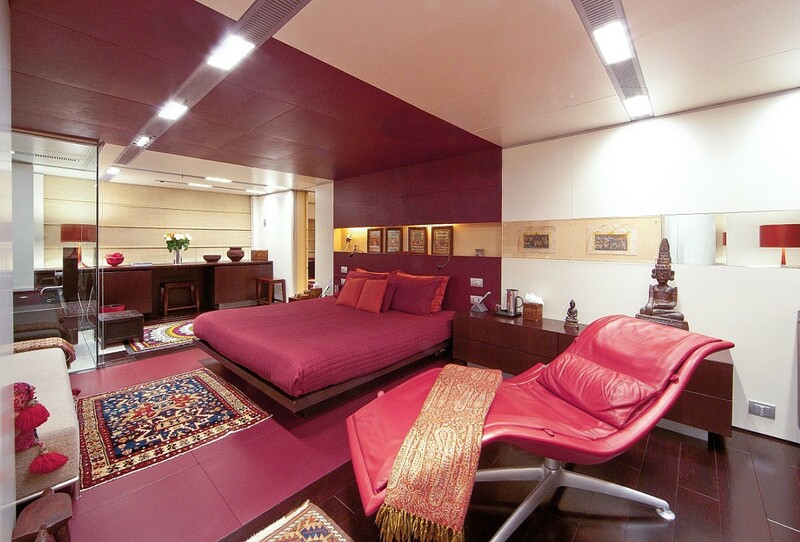 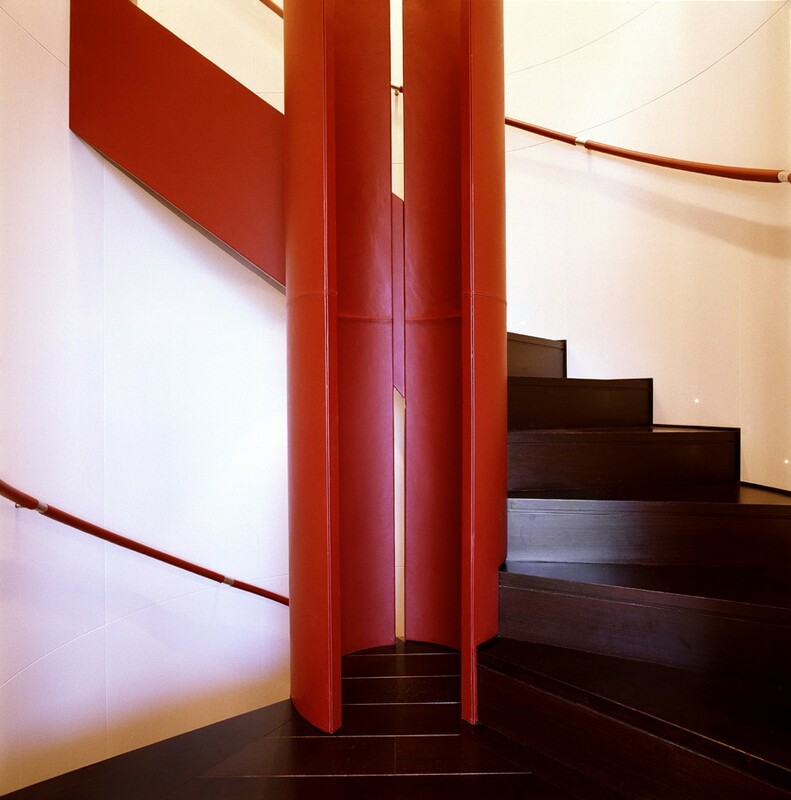 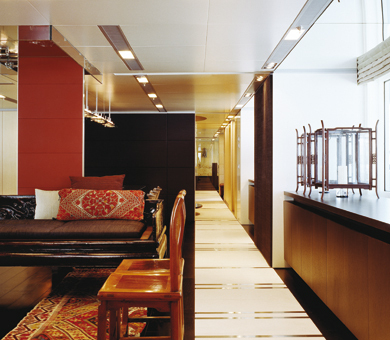 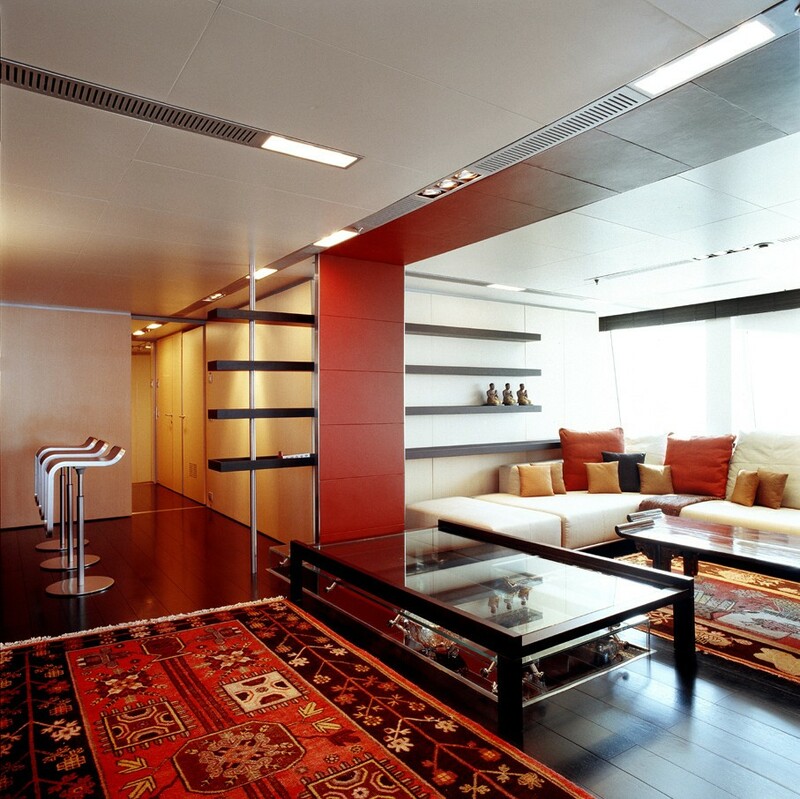 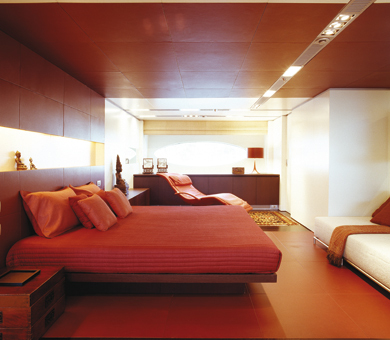 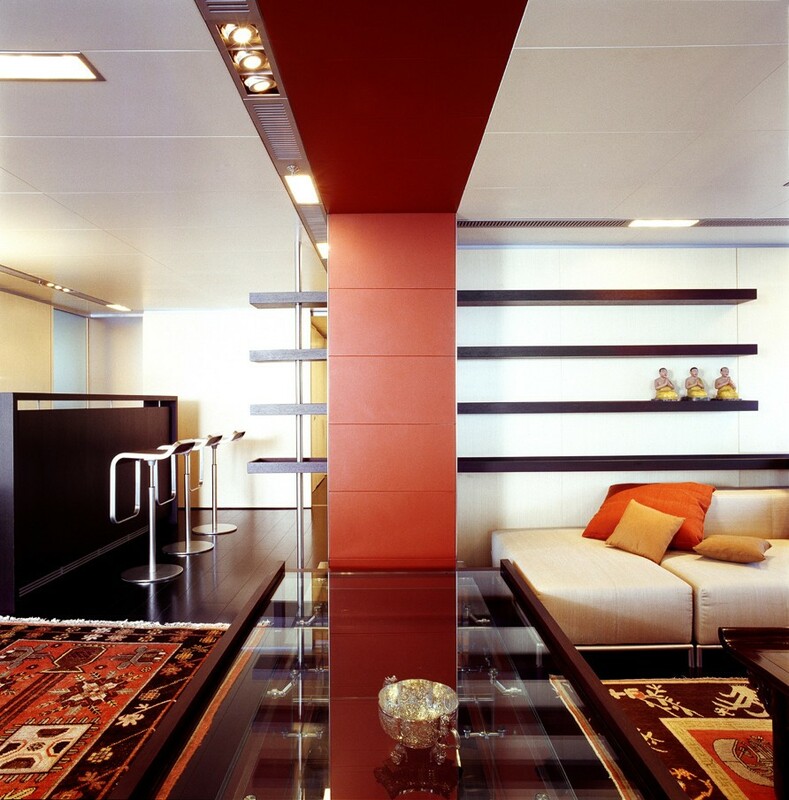 Rich textures and vibrant colours create an enhanced sense of space throughout. 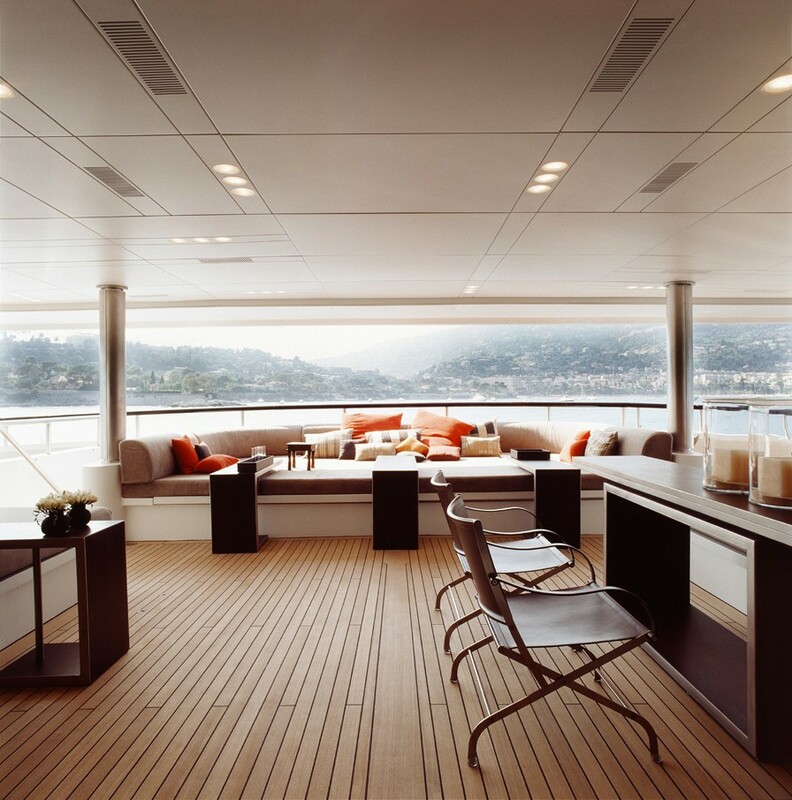 There are two salons aboard. 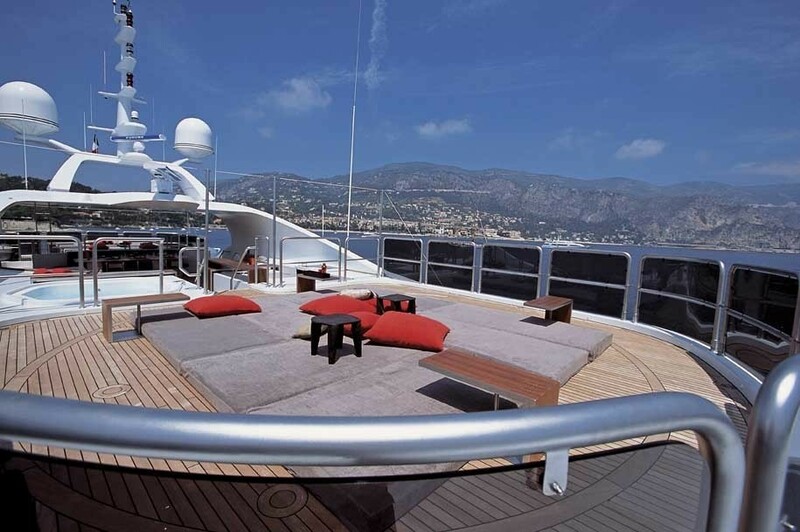 One on the main deck, the other is a Skylounge on the upper deck. 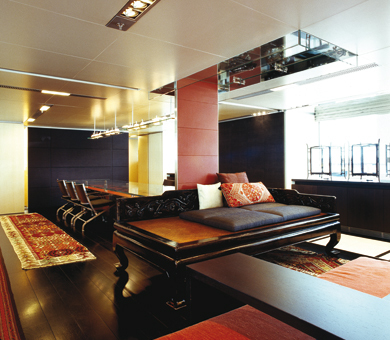 The main salon is welcoming, bright and airy. 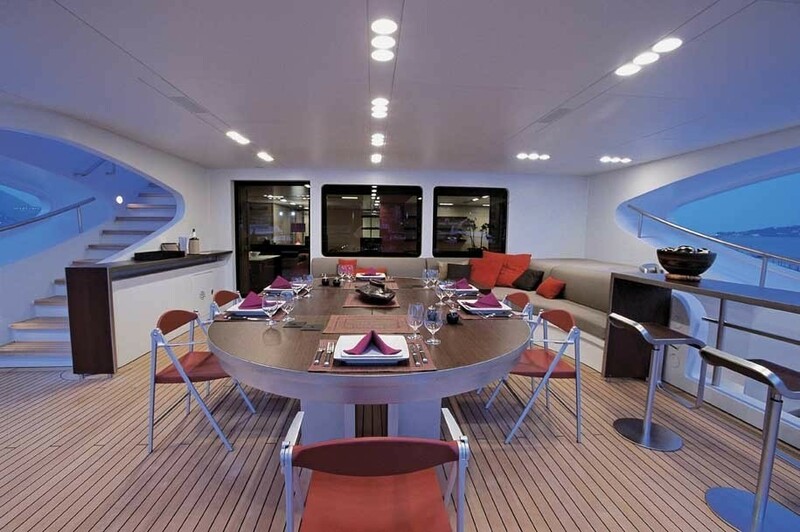 It features ample seating and a large dining area forward with seating for up to 10 guests. 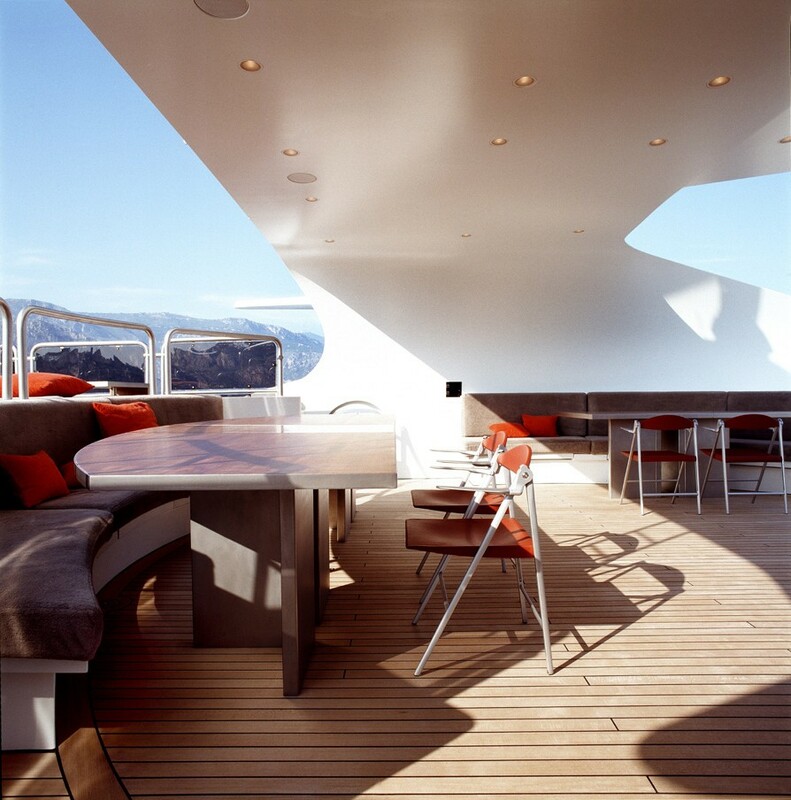 The Skylounge is designed with Feng Shui in mind. 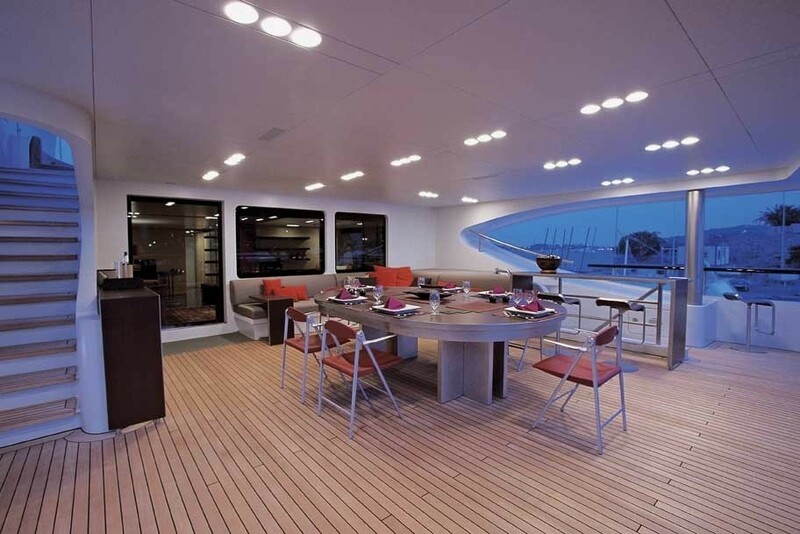 It features a large TV as well as a bar, an alfresco dining table and lounge area. 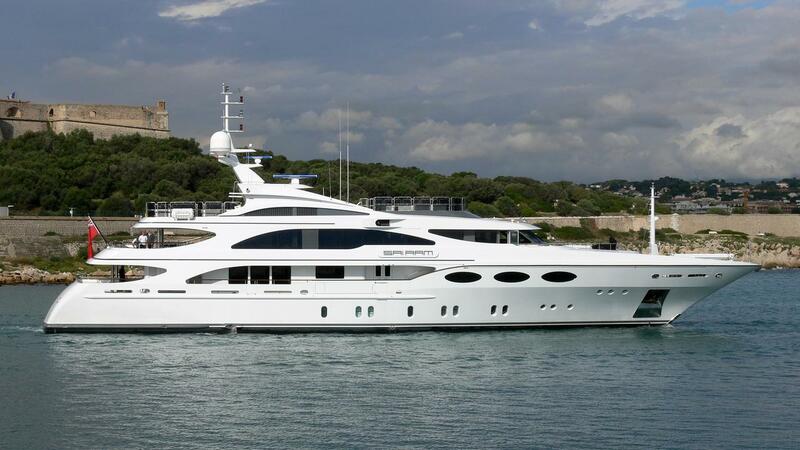 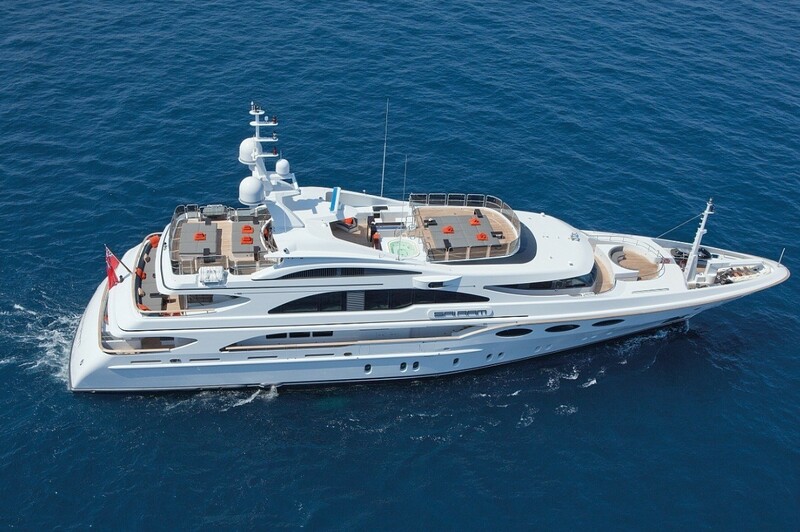 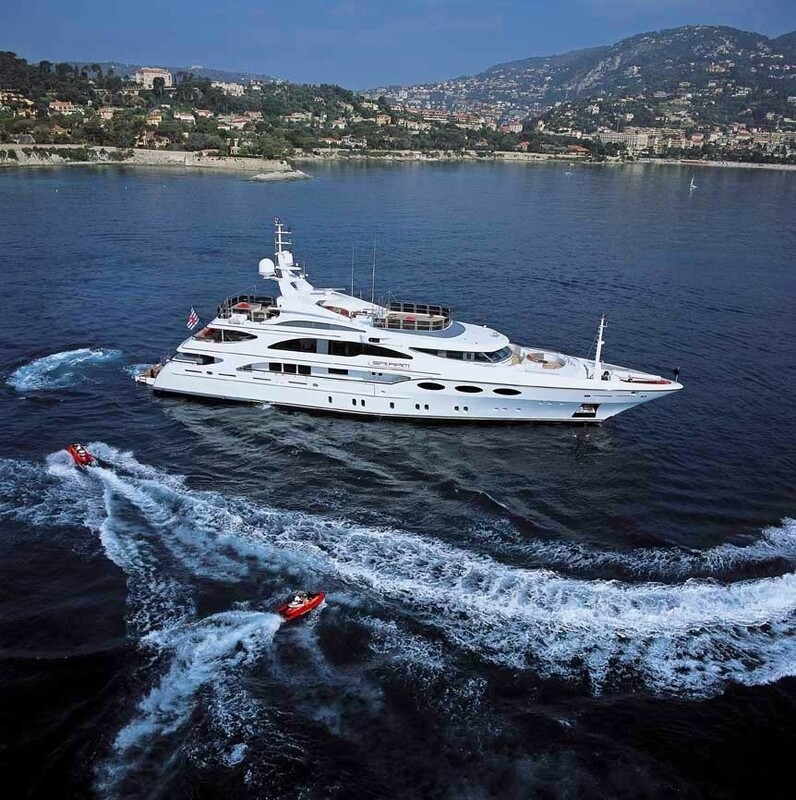 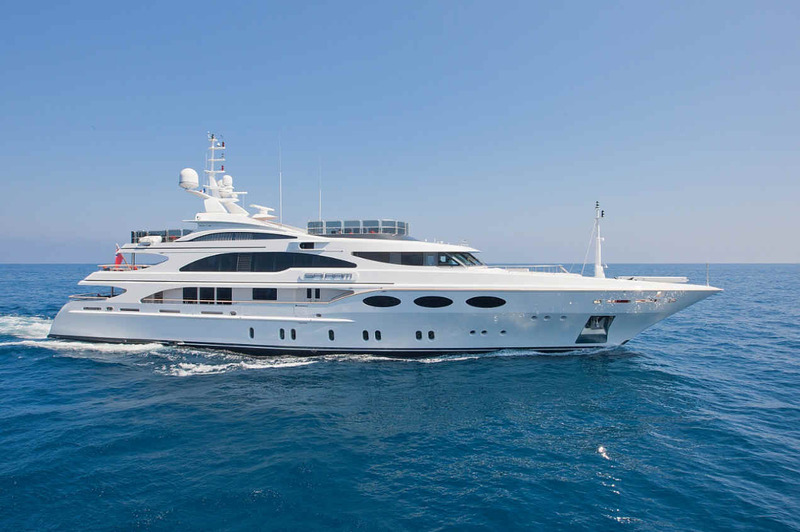 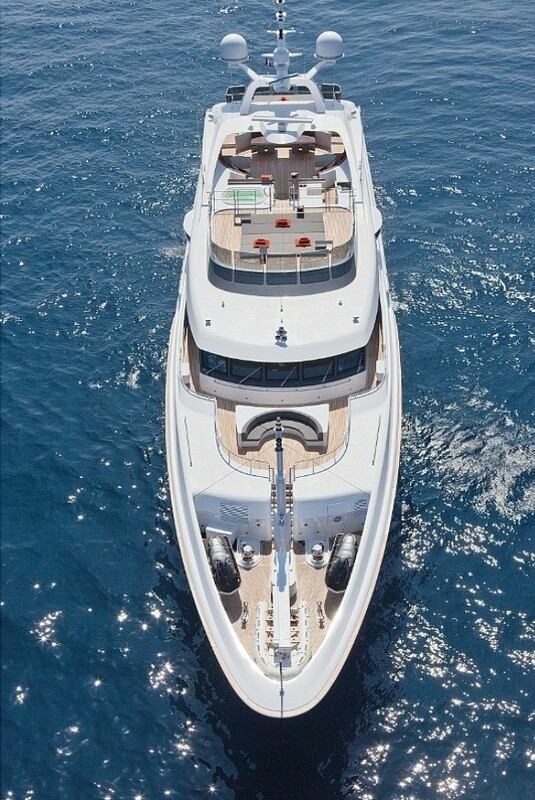 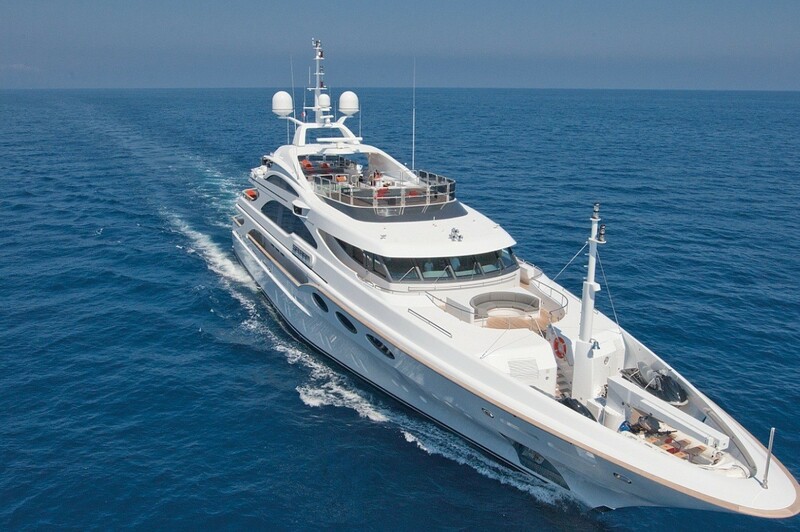 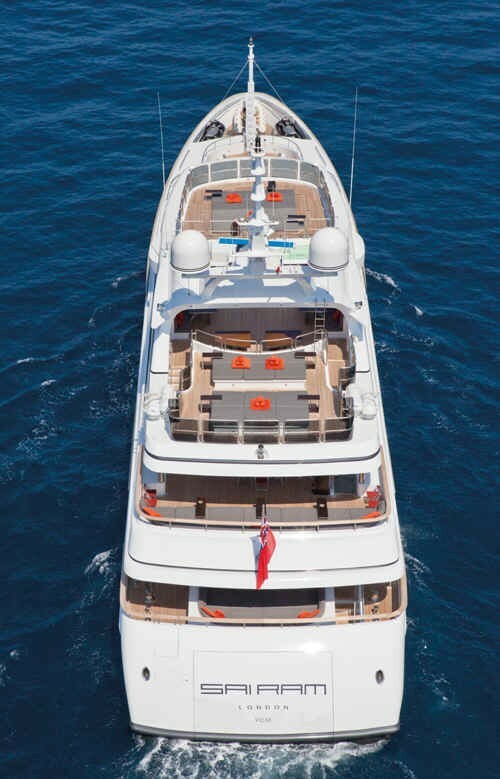 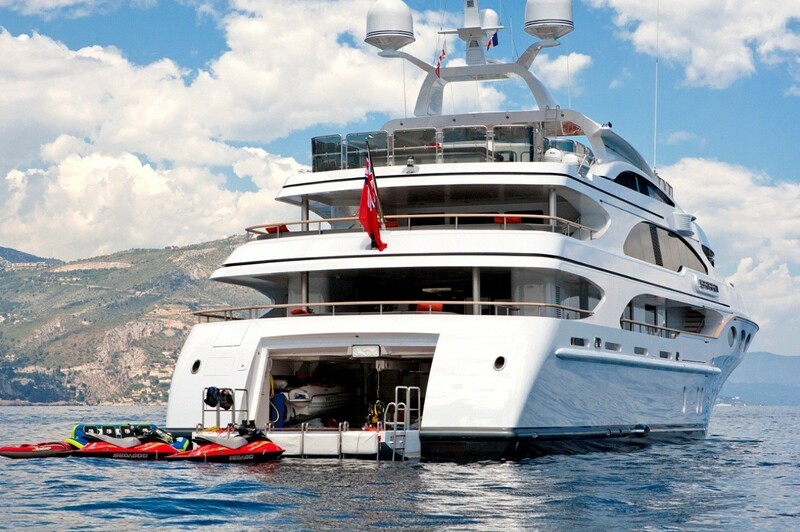 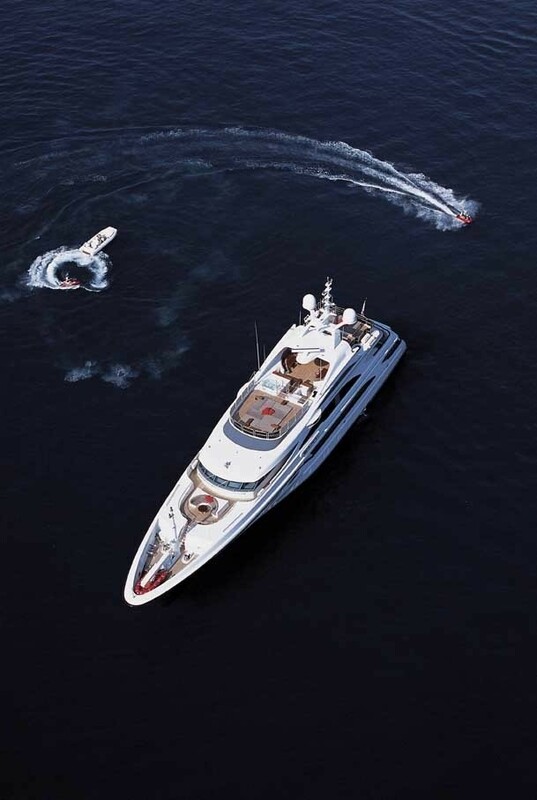 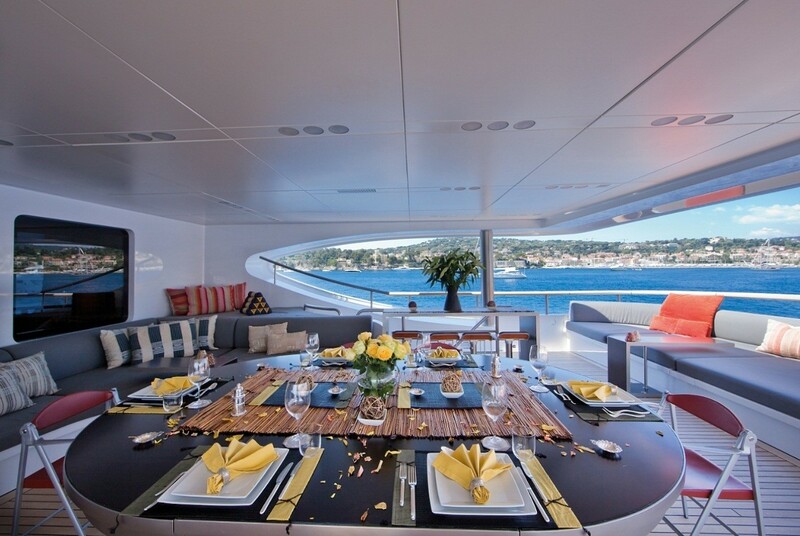 M/Y FALCON's exterior is eye catching and elegant while her deck areas are well designed to maximise outside living. 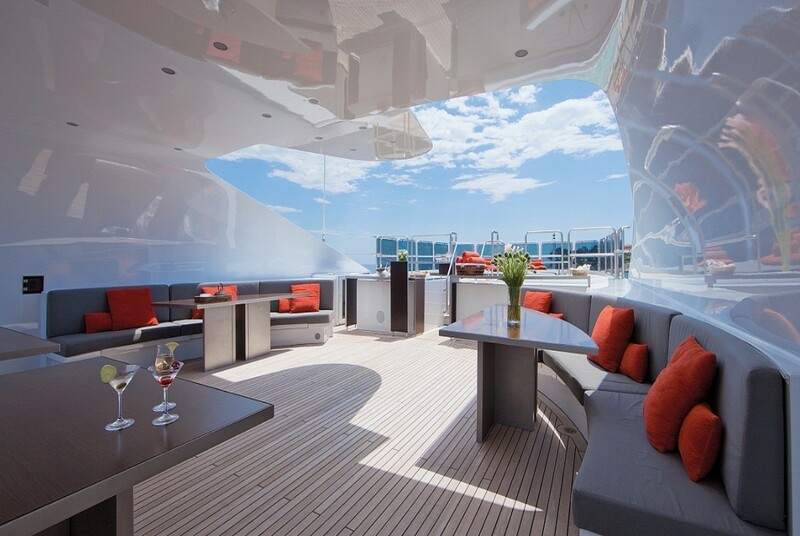 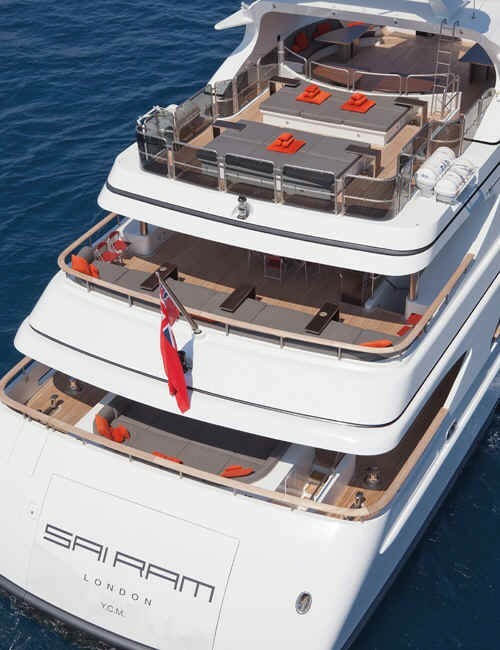 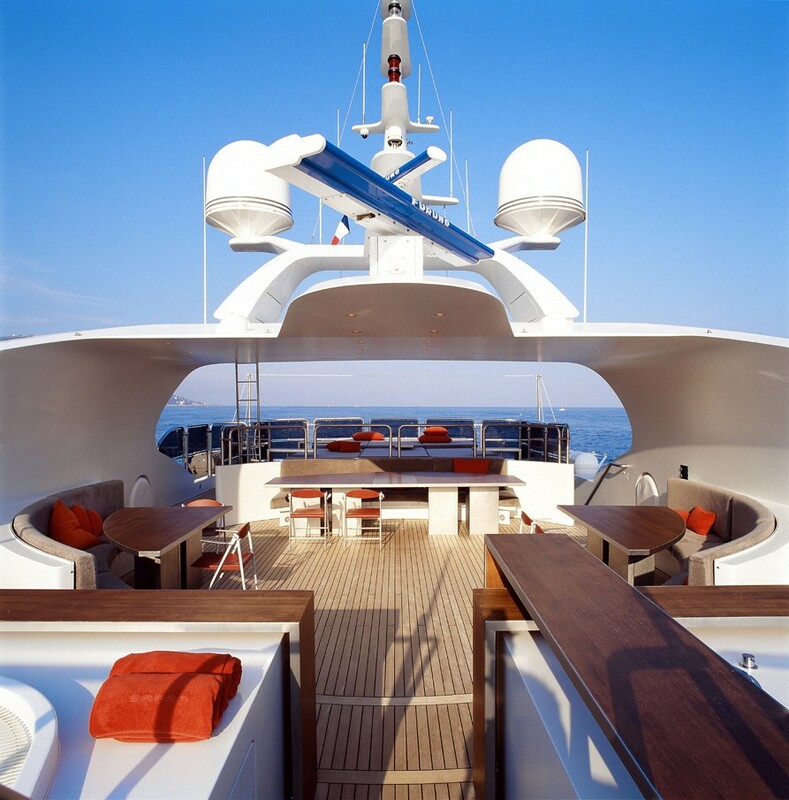 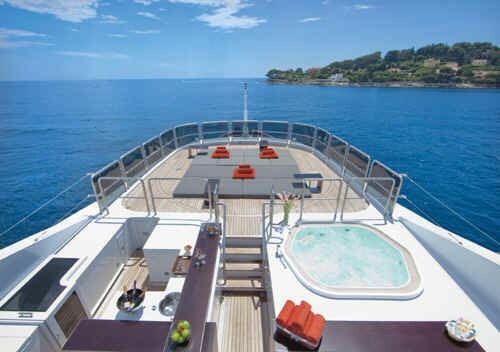 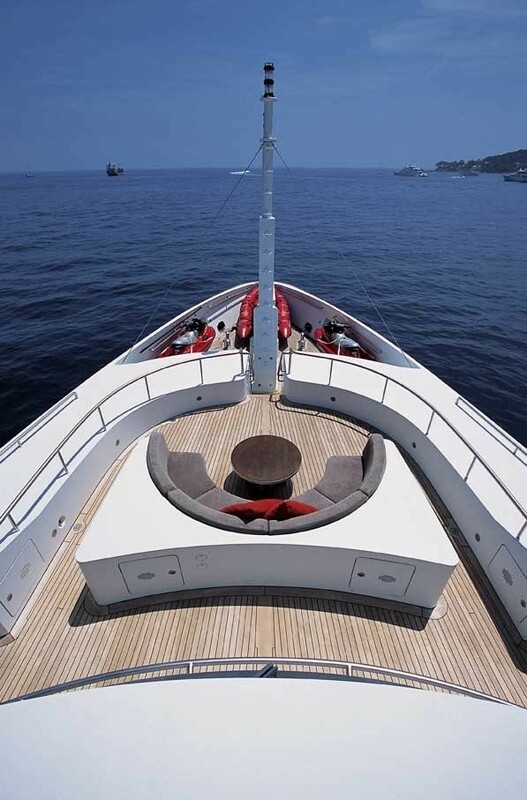 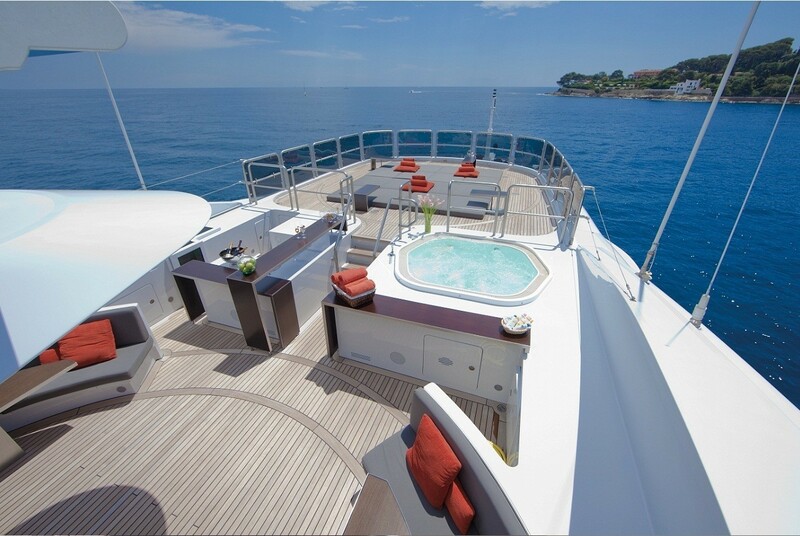 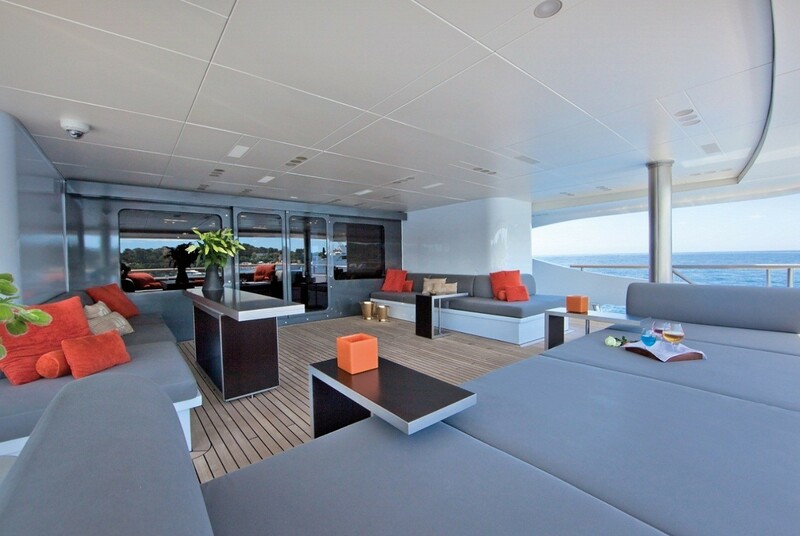 Her sundeck offers a spacious living area with sun beds, Spa Pool, sofas, a bar and a dining area. 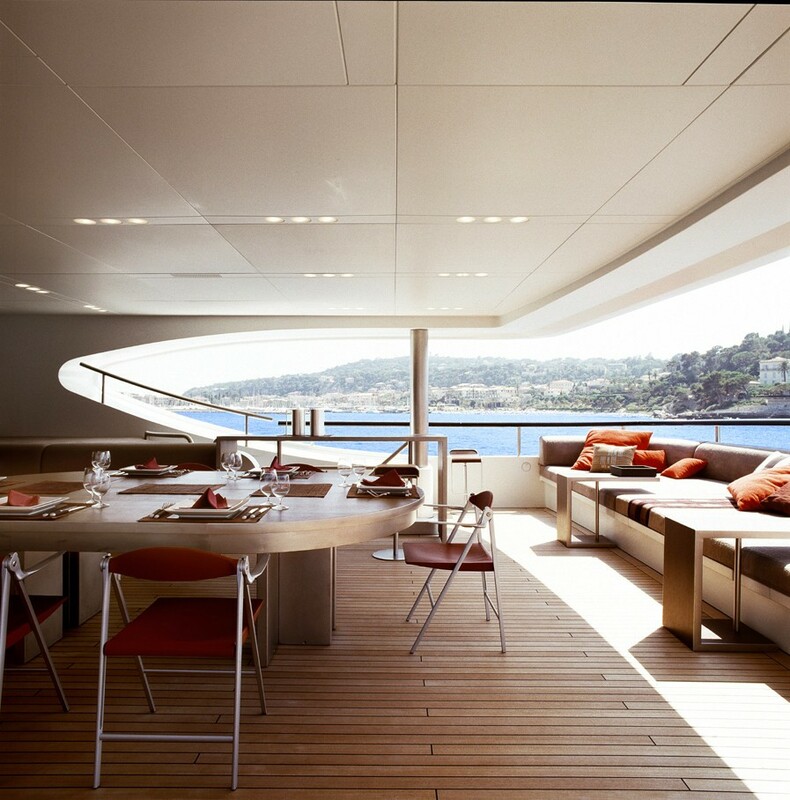 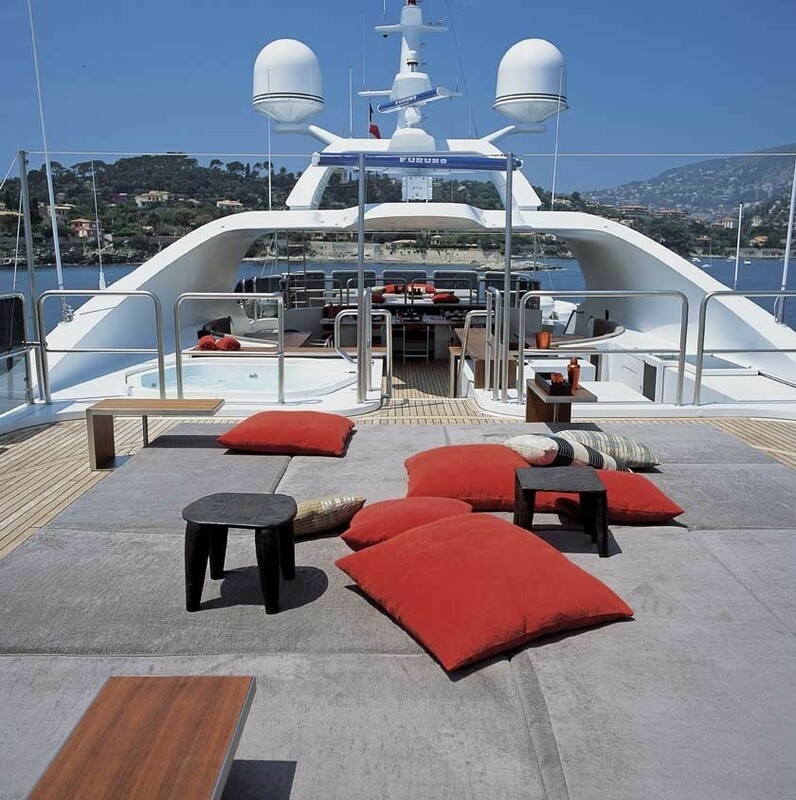 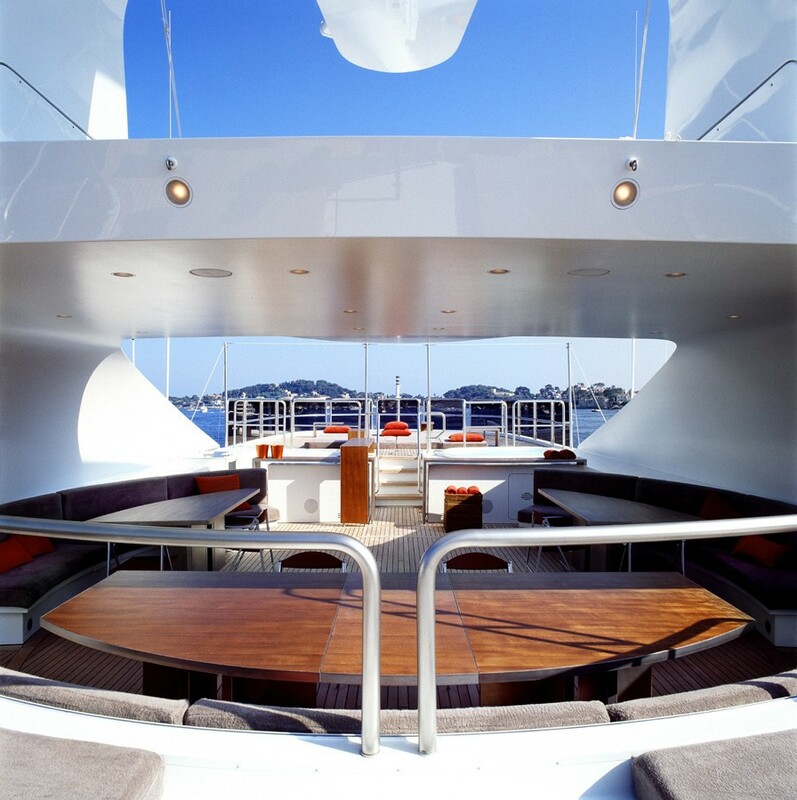 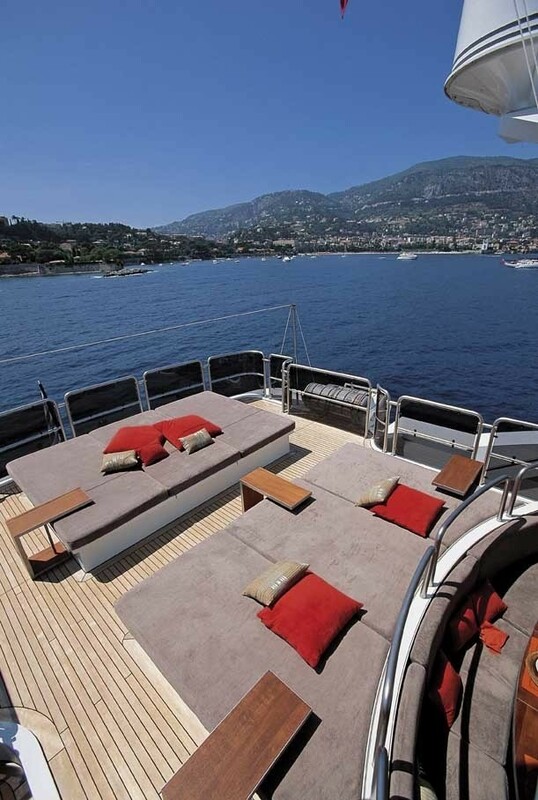 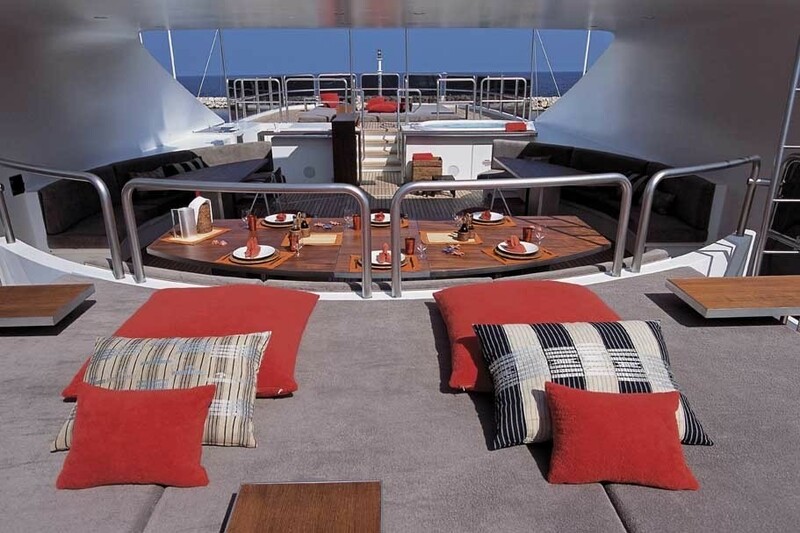 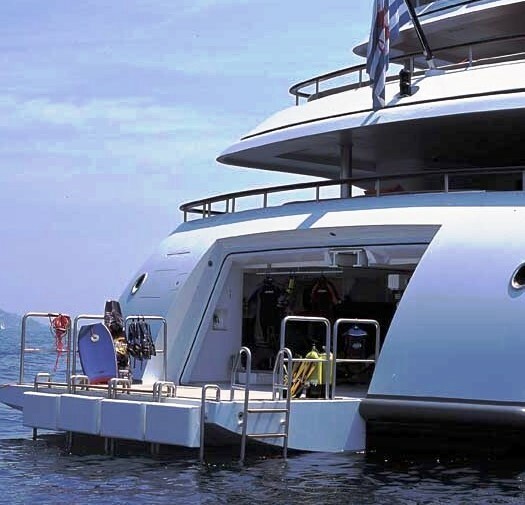 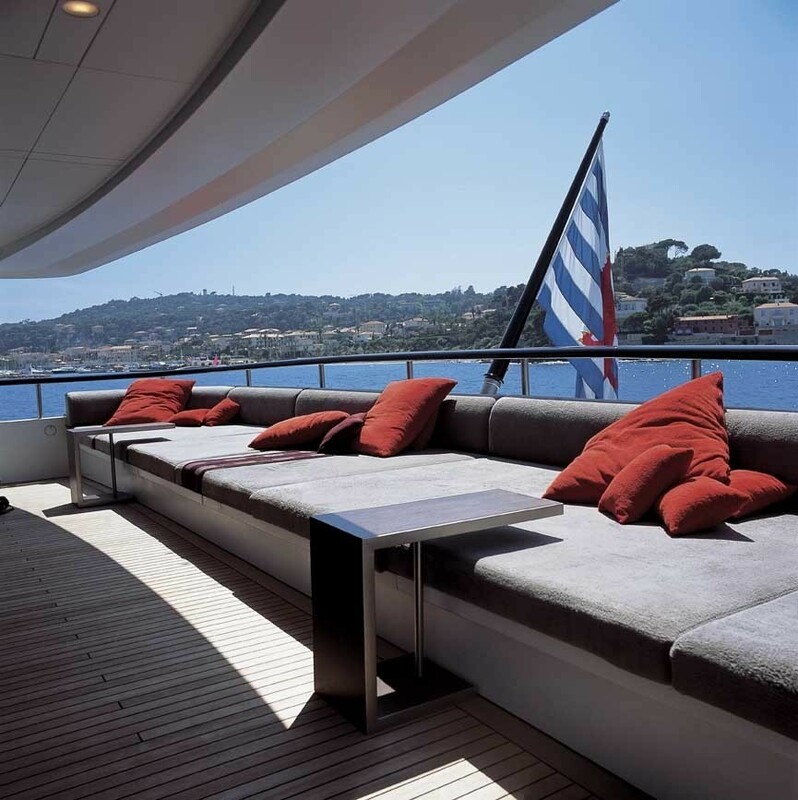 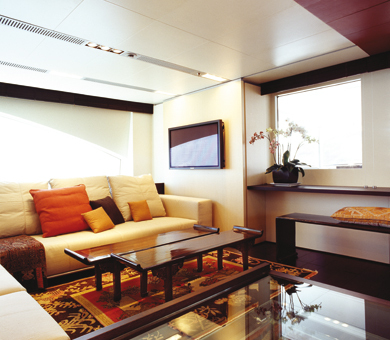 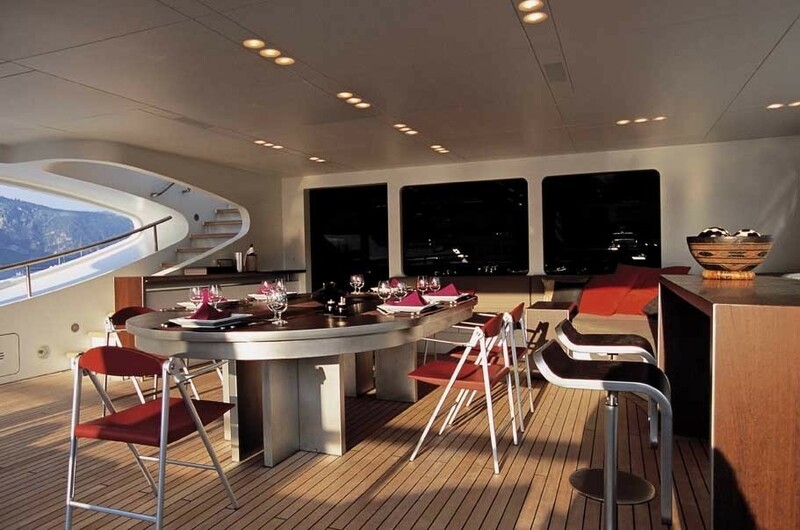 The aft sunbathing area is large and contains a central dining area for up to 28 guests. 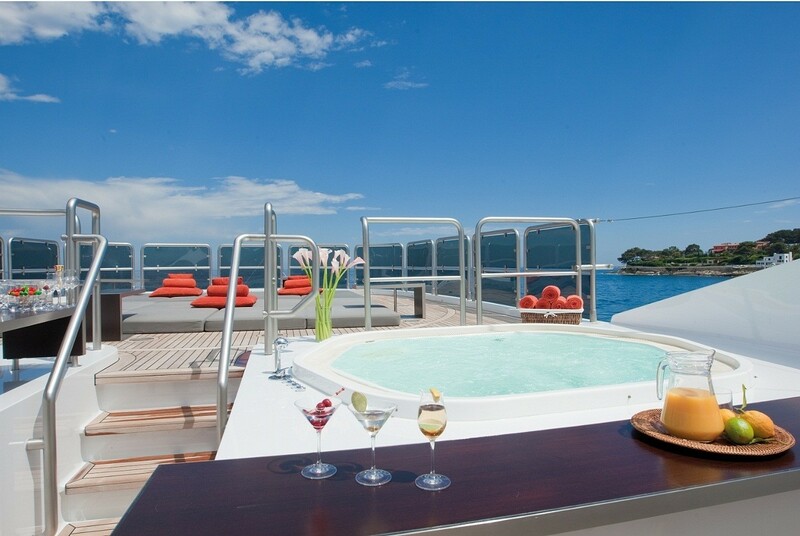 The Jacuzzi, bar and BBQ are located forward and will allow all guests to socialise comfortably. 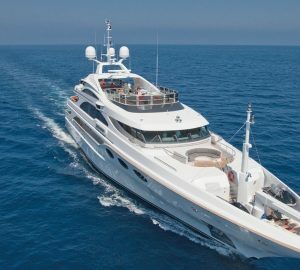 She is powered by two 1800hp CAT engines and cruises comfortably at speeds of 13 knots whilst attaining maximum speeds of 16 knots. 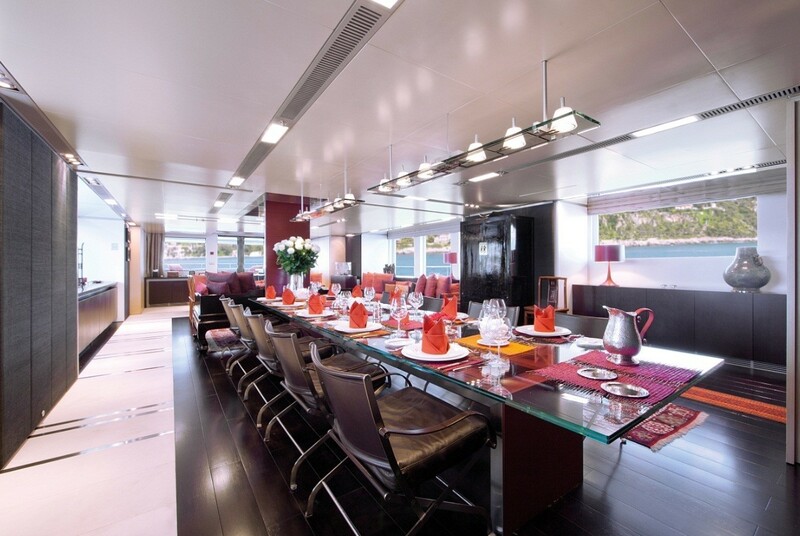 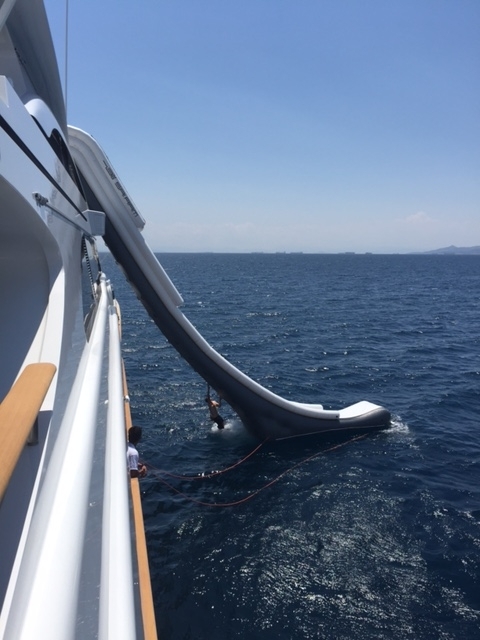 M/Y FALCON received an extensive refit at the new Bilgin Yachts facility and changes have turned her into a superyacht for hosting lavish parties. 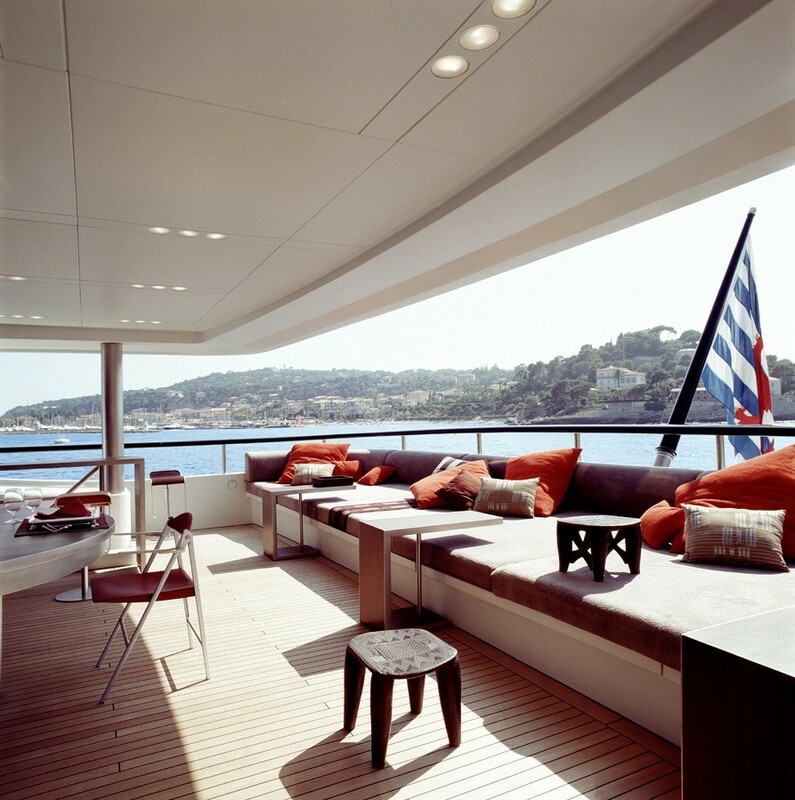 Outdoors, the sundeck has been refurbished with plenty of seating in the sunshine and shade, and the fabrics glow at night. 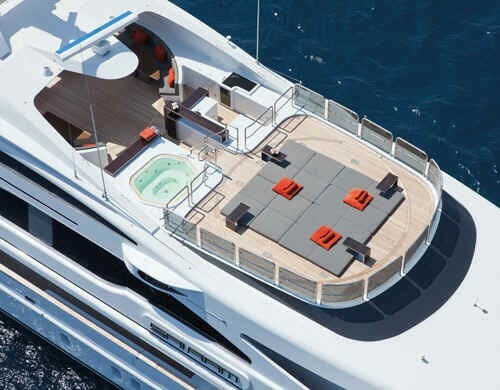 The alfresco dining tables can be height-adjusted, a new glass-walled Jacuzzi has been installed along with a new dayhead adjacent, and the bar and barbeque area have additional lighting as well as new speakers, lasers, steam units and a DJ cabin. 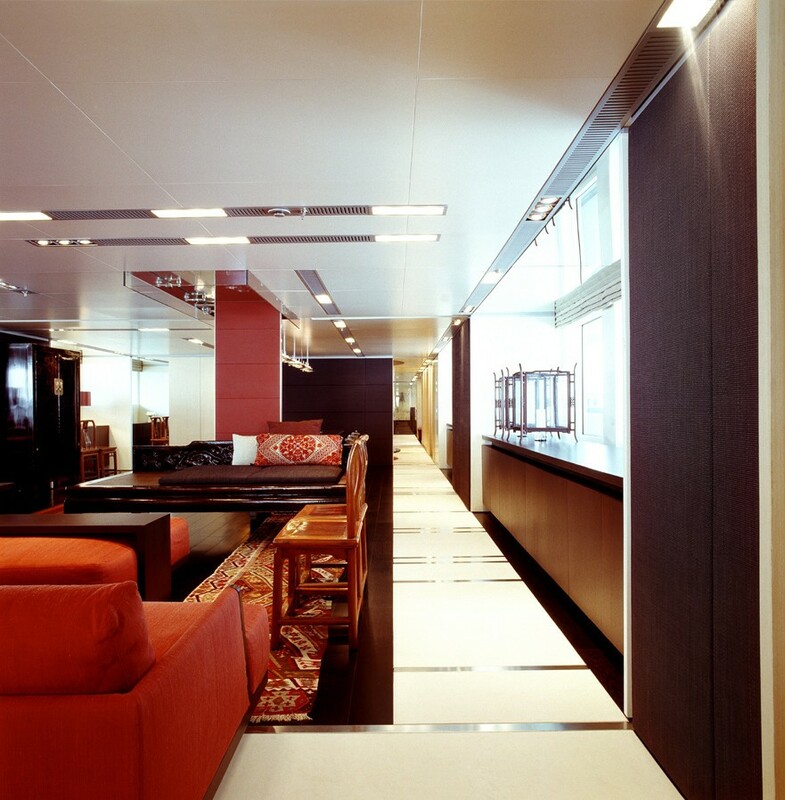 Inside, both the main and upper decks have received a completely new look with the former furnished with new lighter and more colourful upholstery and the latter floor now boasting a whole new layout combining ebony wall panels with decorative mirrors and glasses as well as a bar area for a sultry and sophisticated look. 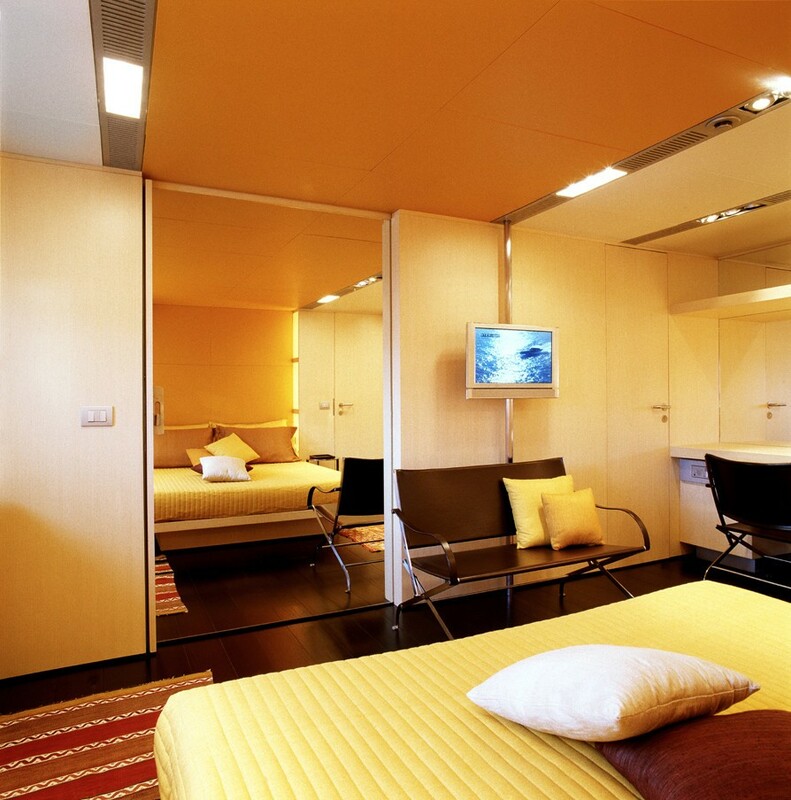 There has been a refreshed design of all cabins, where the cabinetry has been covered in leather and the ceiling panels and headboards have been changed from their original colours for a more atmospheric interior. 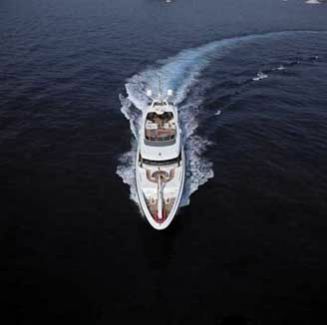 The automation system, hydraulic mechanism, main switchboard, exhaust discharge, circulation pump and fire safety systems all received various maintenance or replacement for top quality responsiveness while cruising and at anchor. 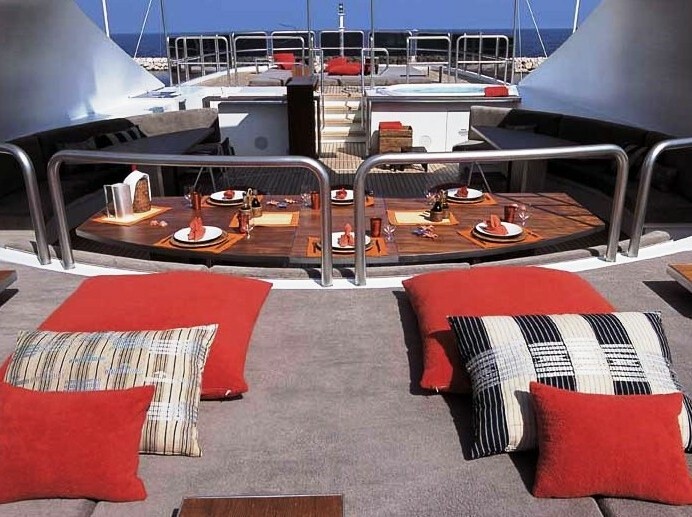 FALCON ofers spacious and comfortable accommodation for 12 guests in 4 double cabins and 2 twin cabins. 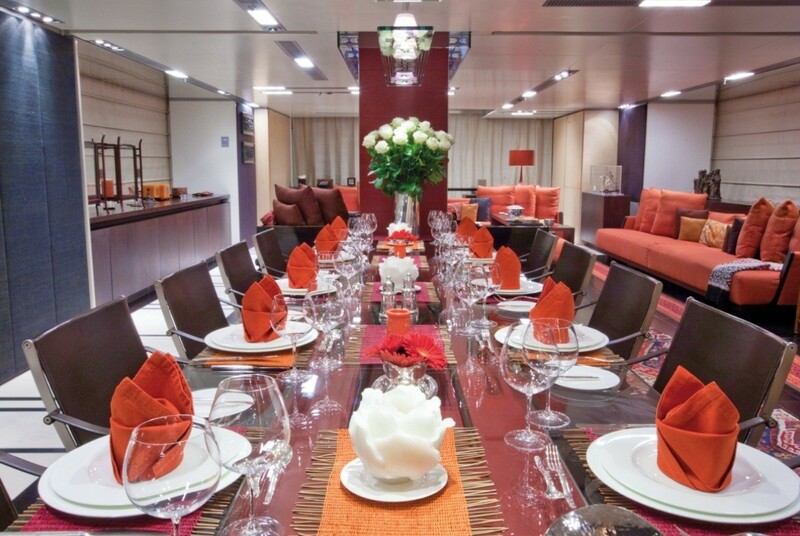 The master stateroom is located on the main deck forward, the VIP cabin is on the upper deck and the four guest cabins are on the lower deck. 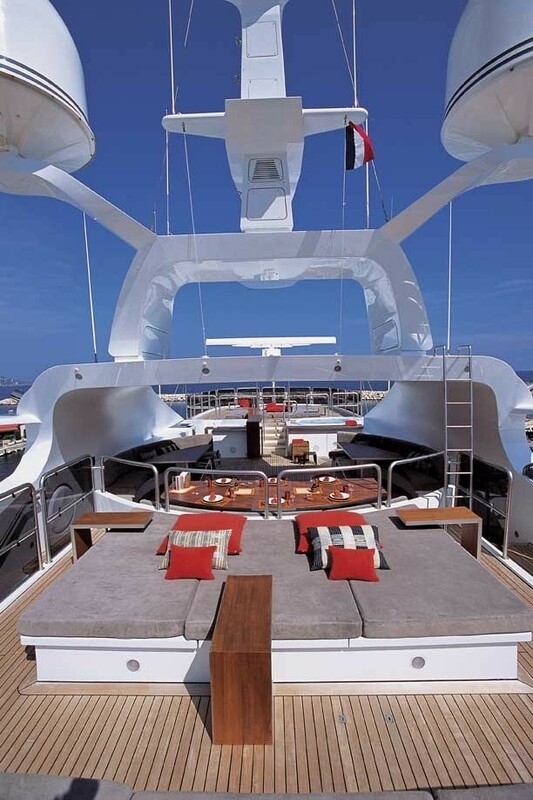 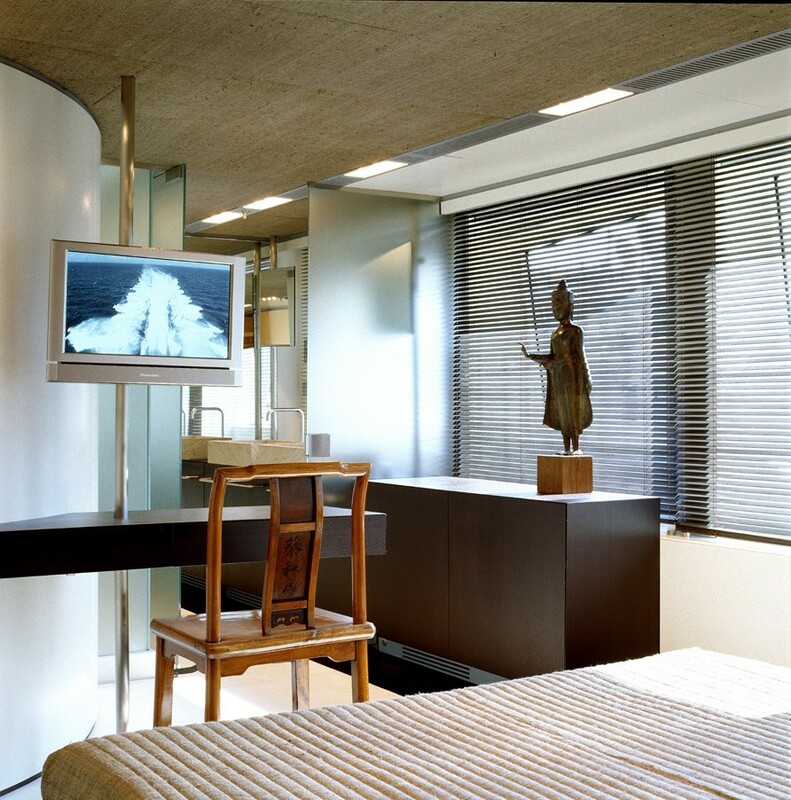 The master suite is full beam of the yacht and features a King Size bed as well as his and hers walk in wardrobe, office and large glass walled ensuite bath. 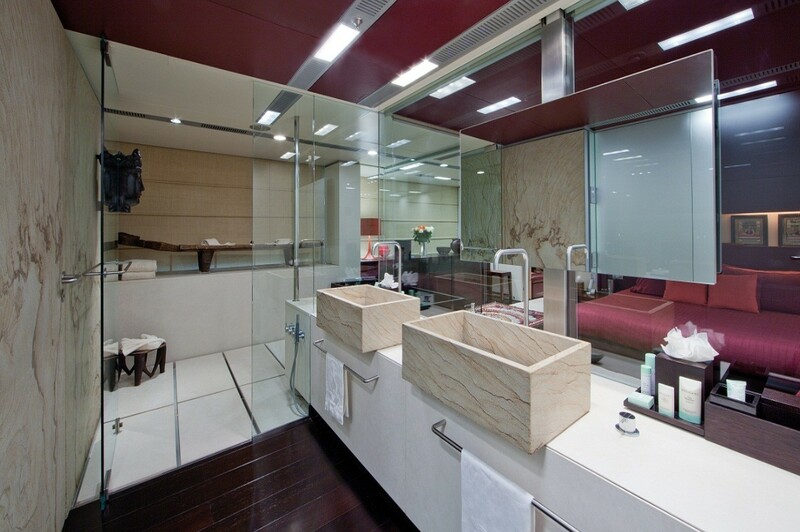 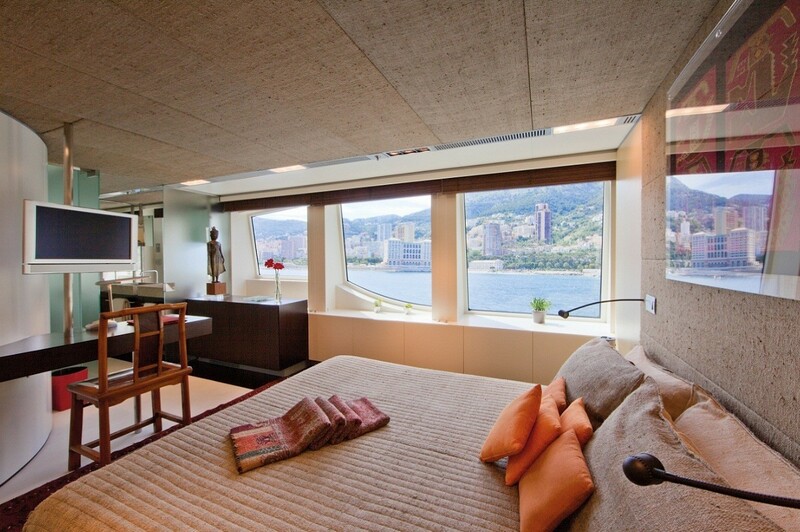 The generous VIP ensuite stateroom is located at upper level and features breathtaking views out at sea. 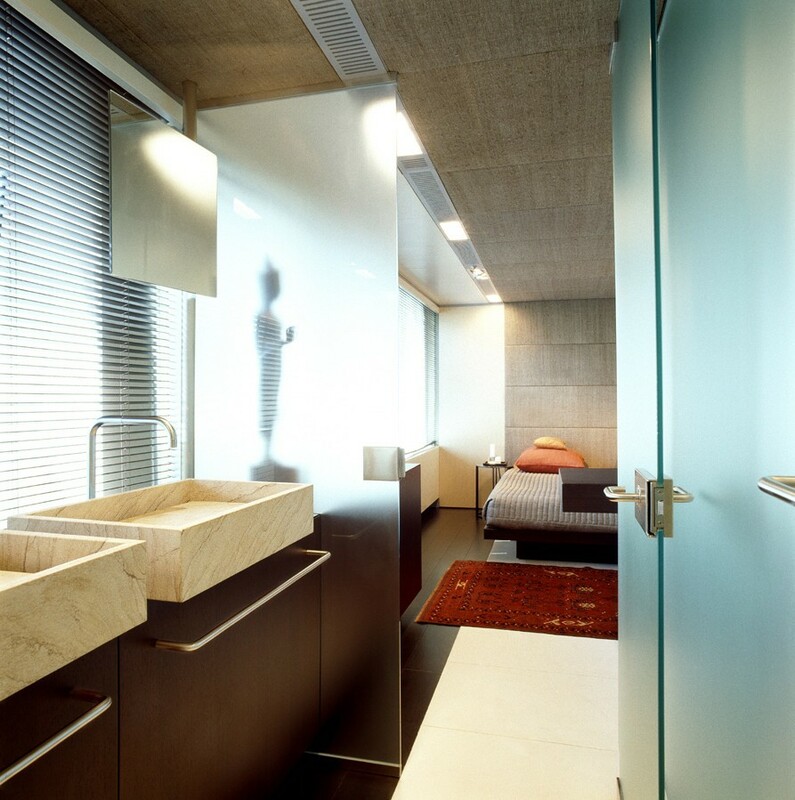 The windows are over sized which allows for plenty of light. 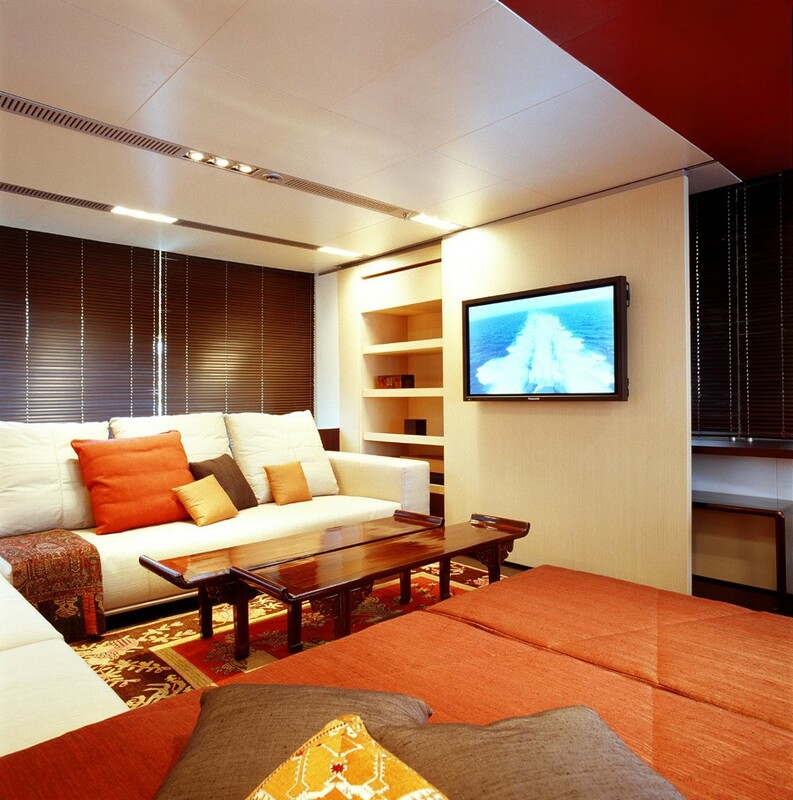 All cabins are ensuite and have fitted walk in wardrobes as well as TV screens. 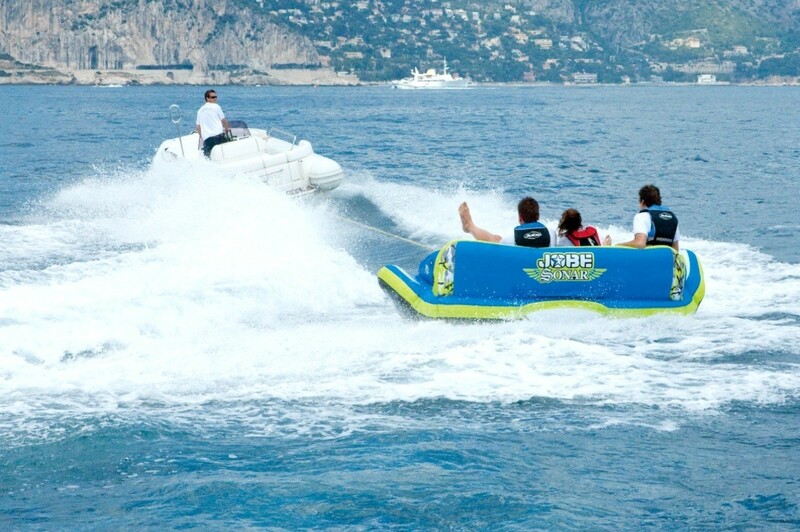 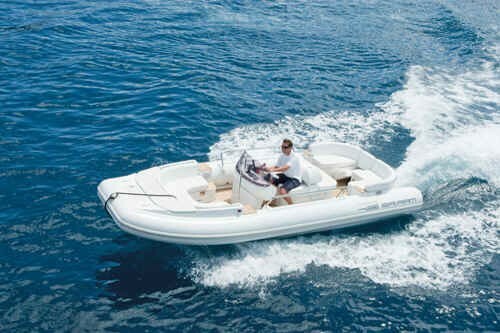 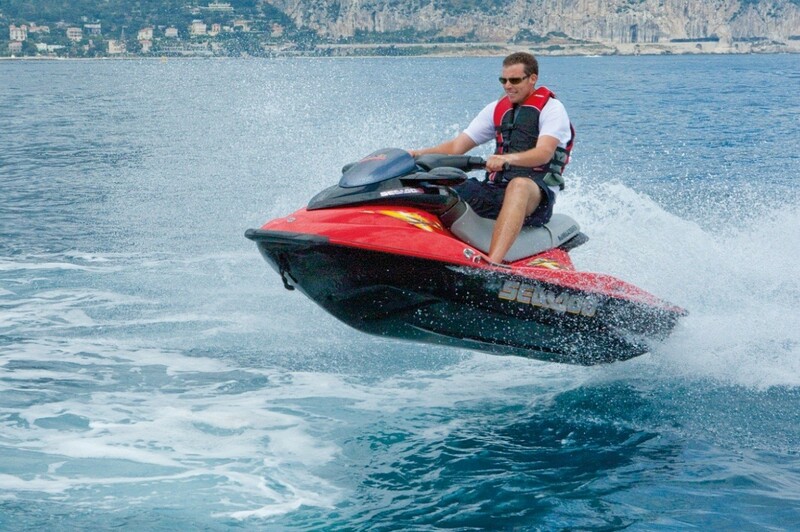 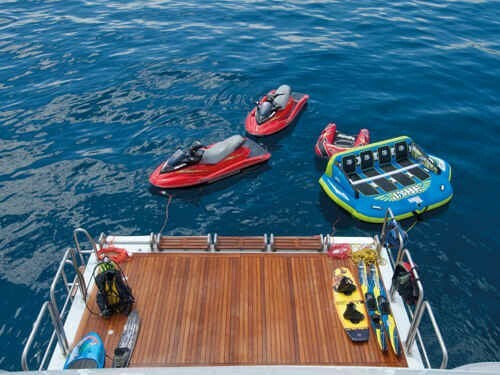 FALCON is equipped with a range of tenders and toys including: 21ft Castoldi Jet with 240hp inboard diesel engine, 5m Novurania 500 Equator tender with 130hp engine, 5m Zodiac rescue boat with 25hp outboard, 2 x 2 men 1300cc Seadoo jetskis, Waterskis, wakeboards & inflatables. 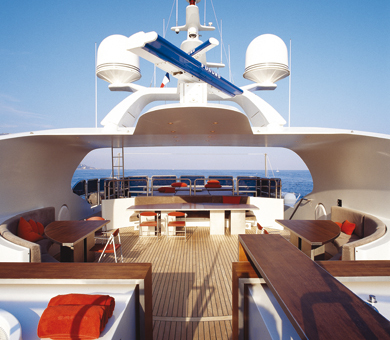 Communication facilities onboard include Satcom tel & Fax, GSM tel & fax, E-mail via UMTS, GPRS and Fleet 77. 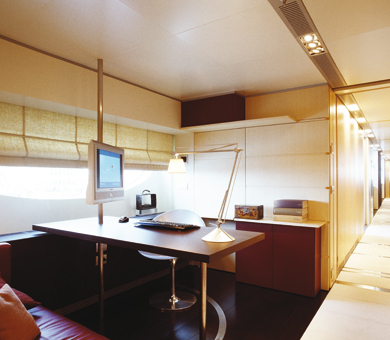 3 Guest computers are available in the Master Cabin, Upper and Main Saloon. 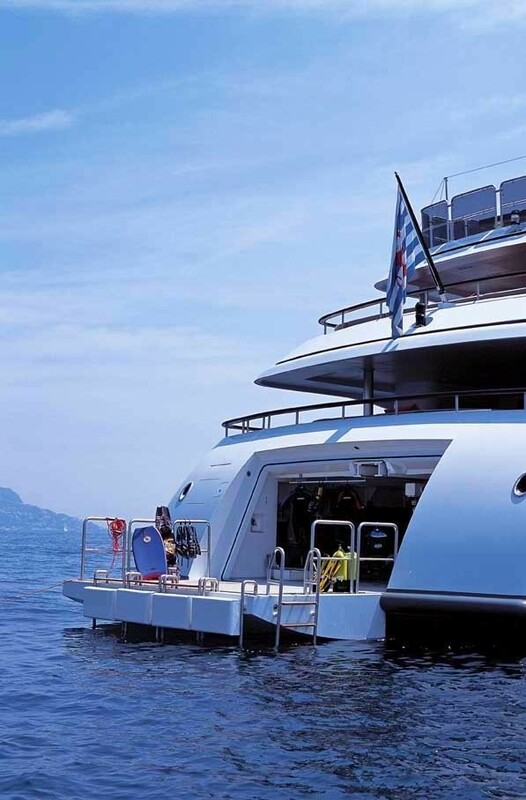 Network connections allow toconnect personal laptops anywhere around the boat. 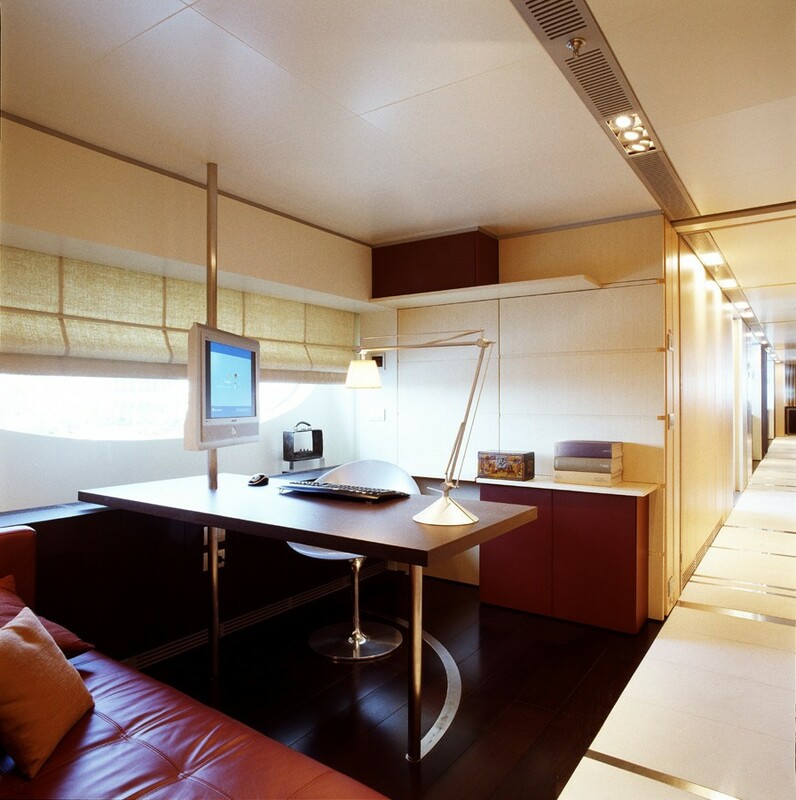 Wifi service in Main saloon and Upper saloon. 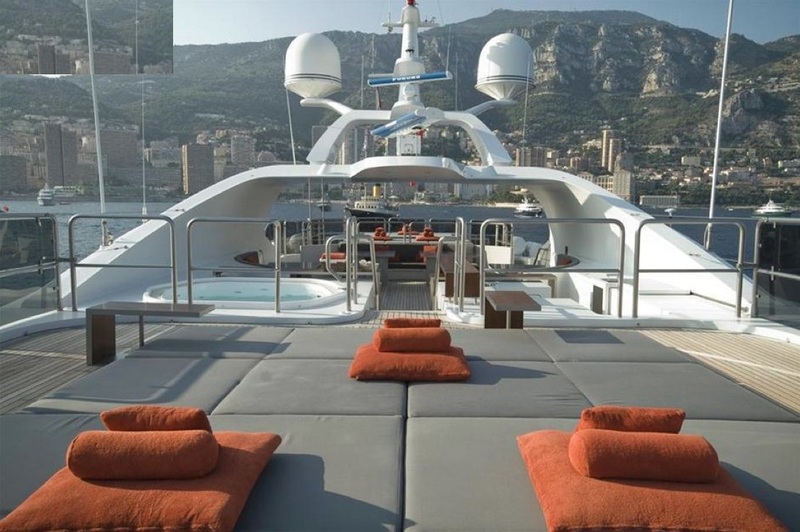 She also has audio visual equipment throughout including LINN music on demand and Satellite TV available in Main and Upper Saloons, Master and VIP Cabins.